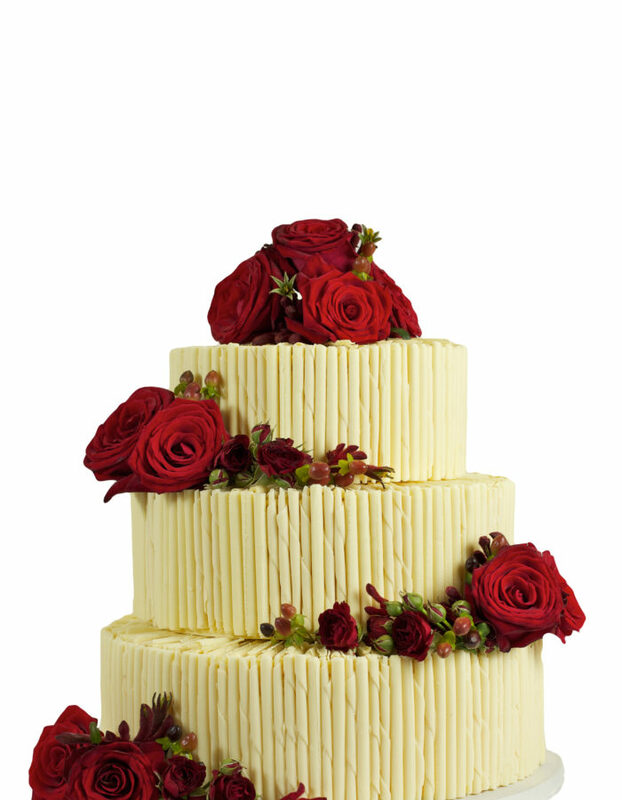 We are experts in creating a perfectly smooth texture with pure white chocolate, giving the appearance of a classically finished cake. 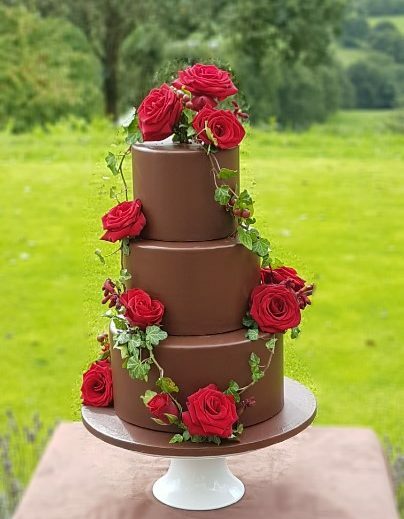 People are often amazed that the covering finish is 100% chocolate and there is no icing / no fondant/ no marzipan for a pure and unadulterated indulgent chocolate experience. 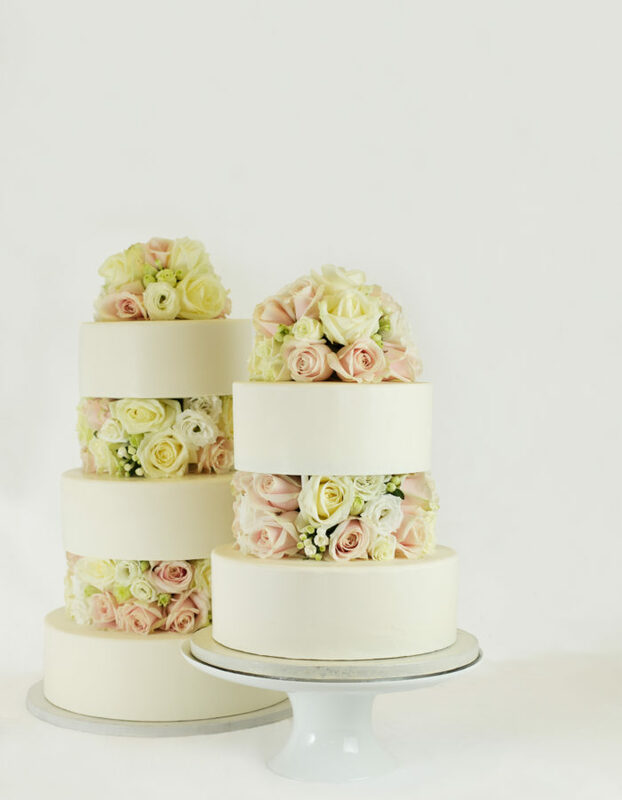 A whole range of white / cream shades can be achieved. 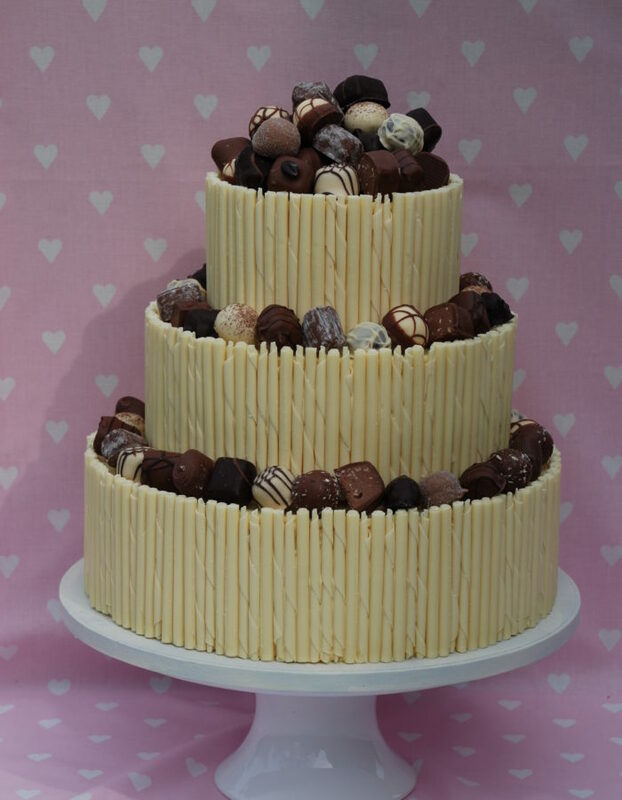 Smooth white chocolate is poured on top of a white chocolate ganache which is covering our lovely chocolate sacher torte cake / carrot cake or other flavours. 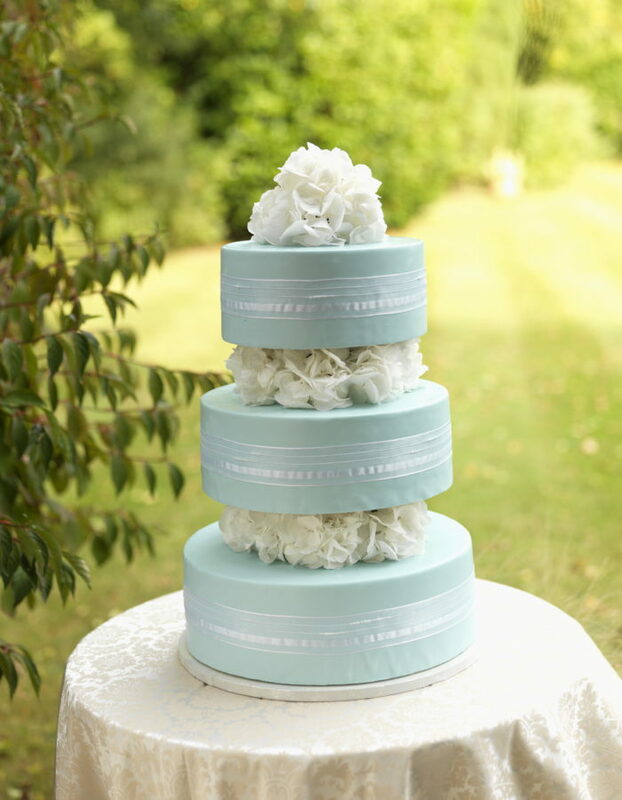 A perfect backdrop for your wedding colour palette of flowers or classic whites and greens. 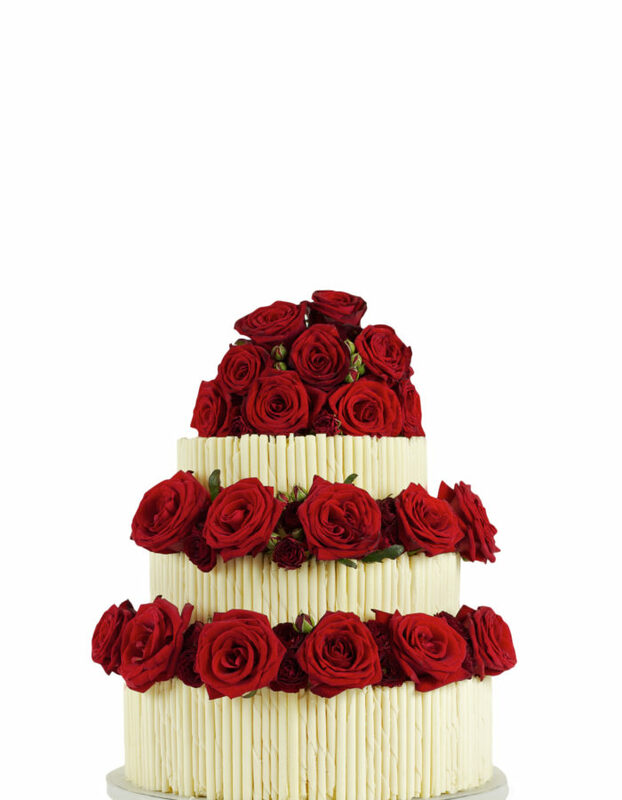 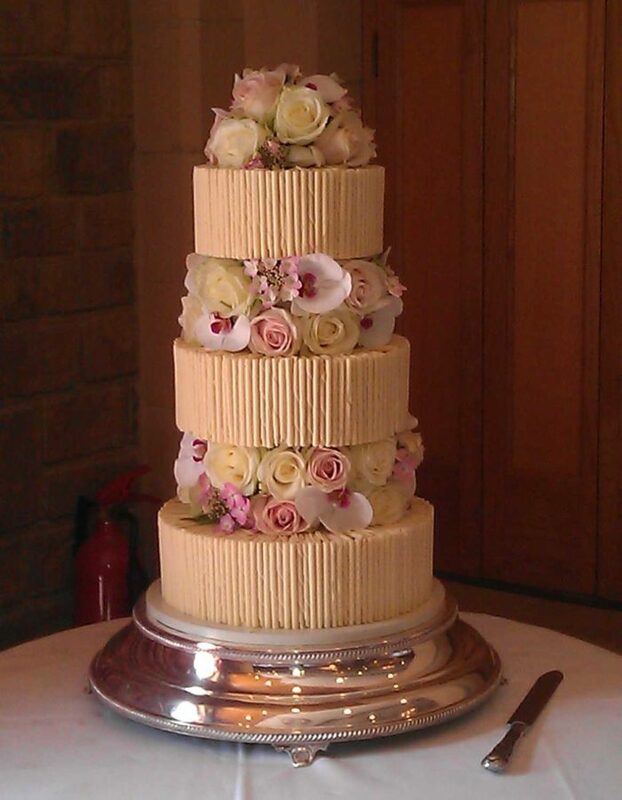 Available in the classic or taller tier designs, stacked or with the fresh flowers between the layers. 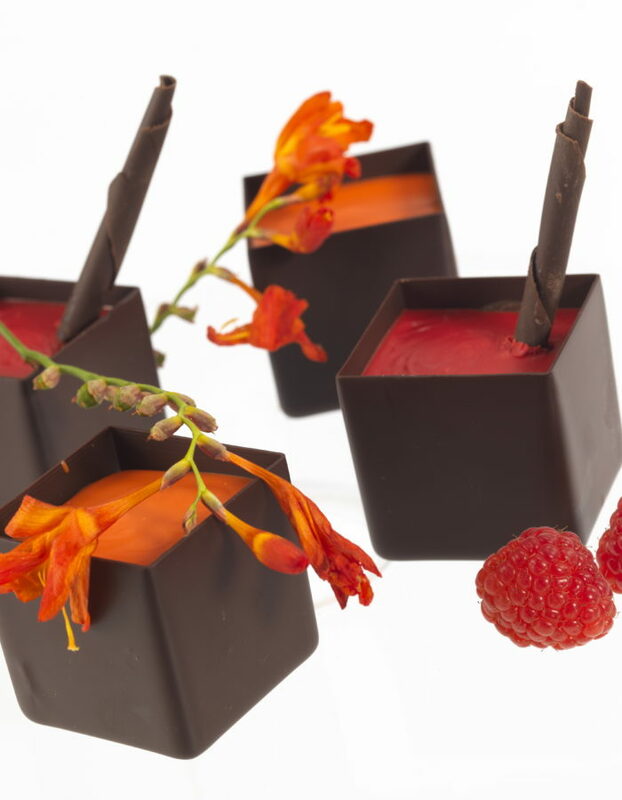 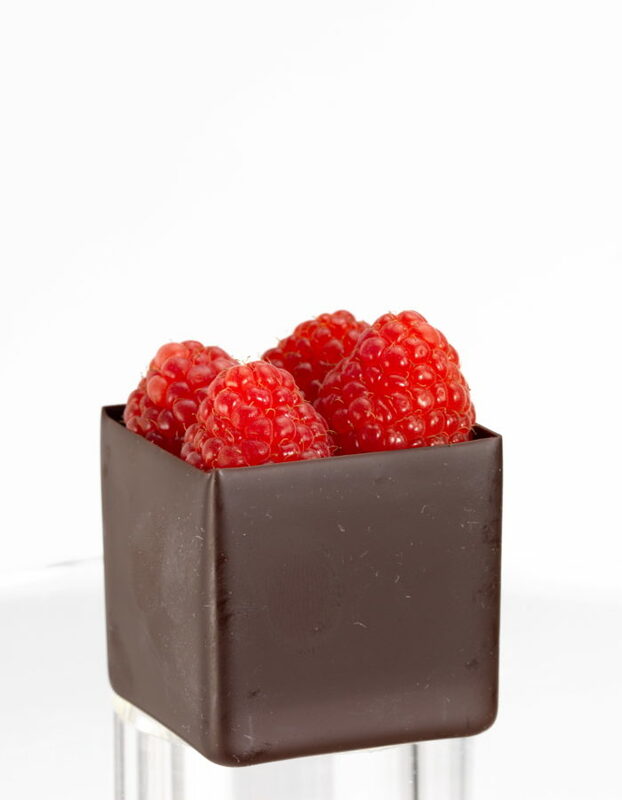 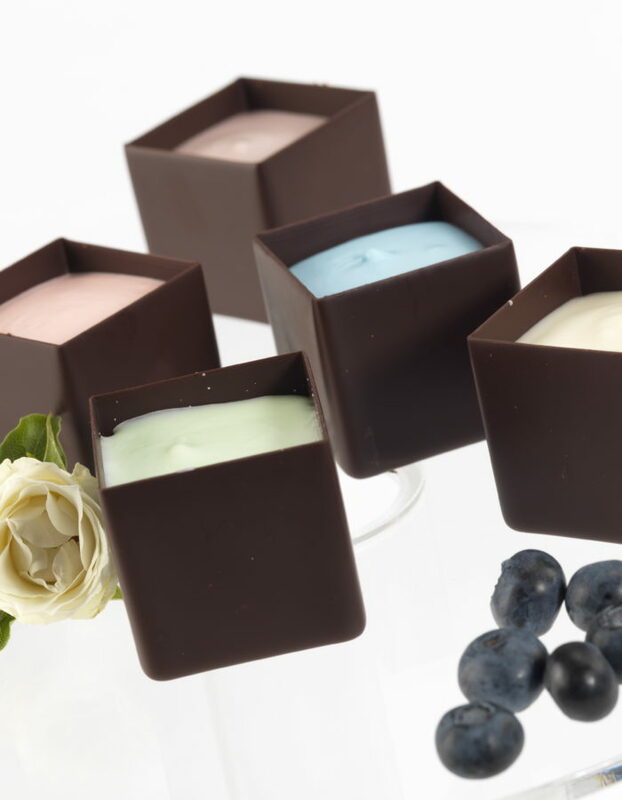 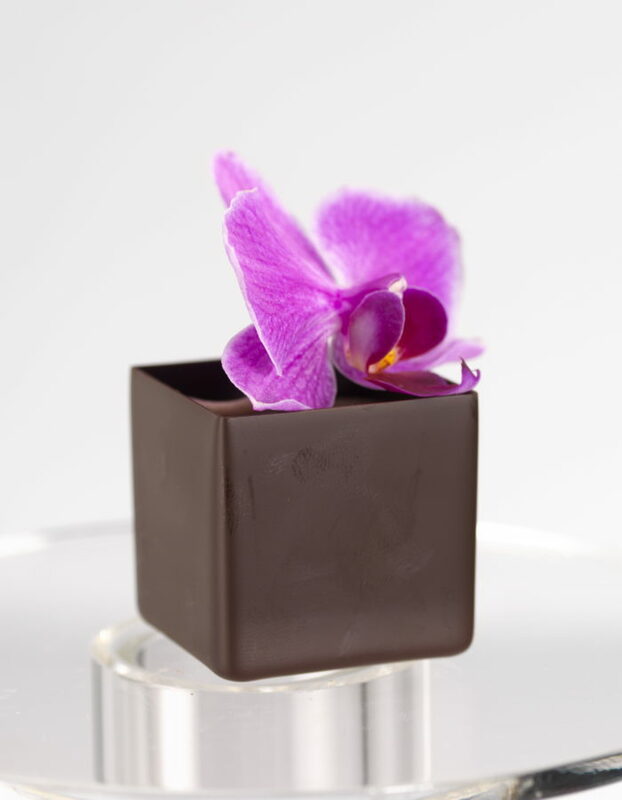 These mini boxes are made from an exquisite quality dark chocolate, filled with chocolate Sachertorte and topped with a layer of chocolate truffle which can be coloured or flavoured with a hint of chilli, praline, black pepper, orange, lavender, rosemary, cardamom, raspberry or vanilla. 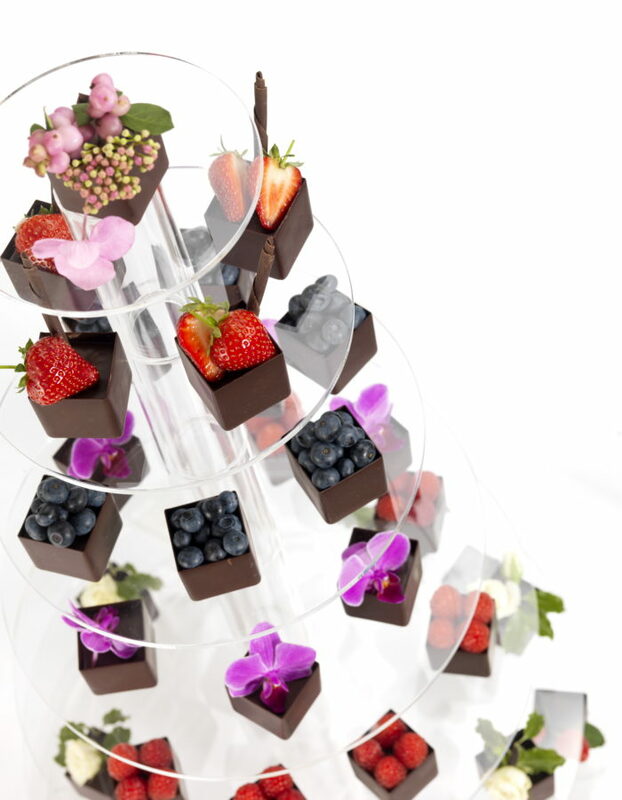 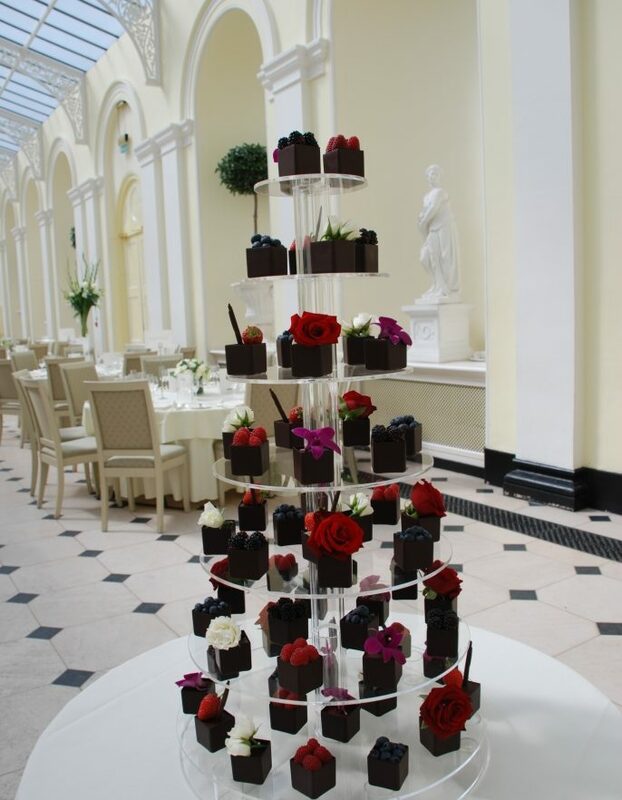 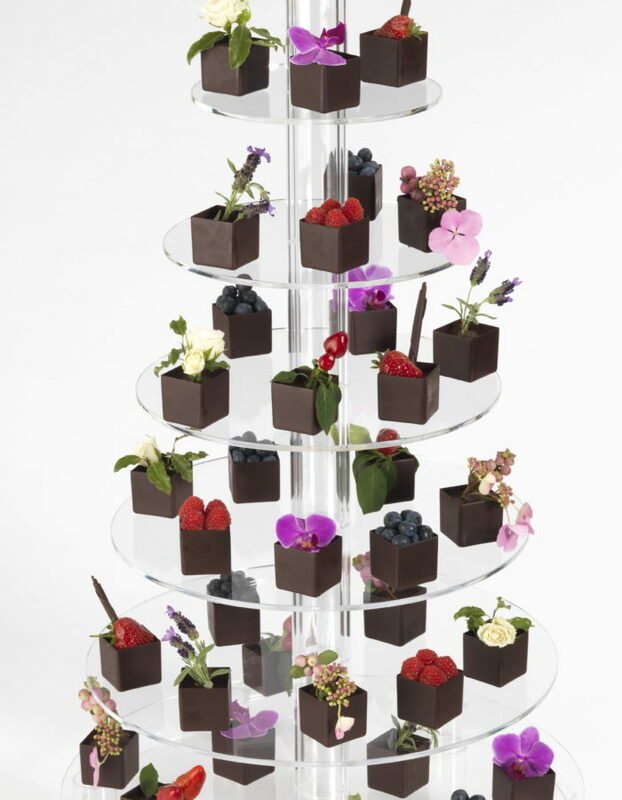 You can choose to have them presented on a tiered stand and decorated with fruits or flowers, or use them as favours for your wedding guests, individually and neatly packaged so they are easy to take home. 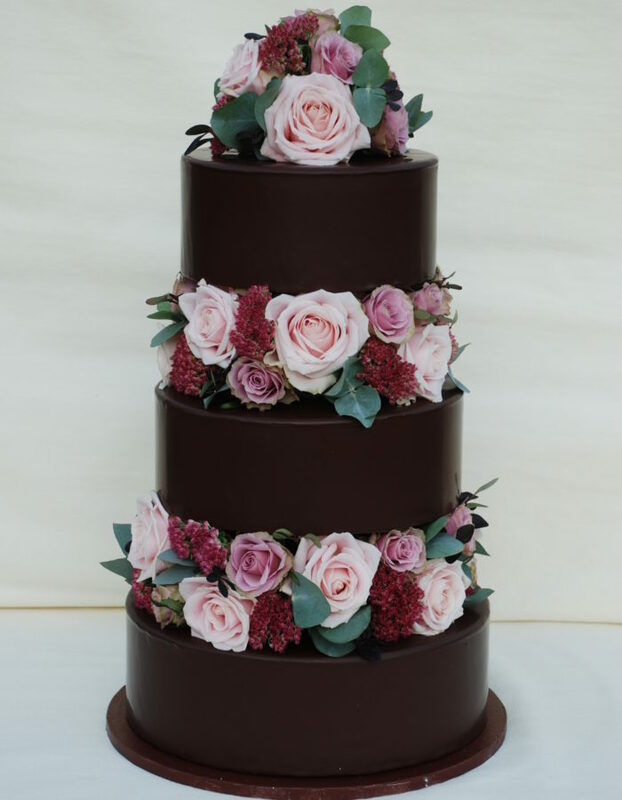 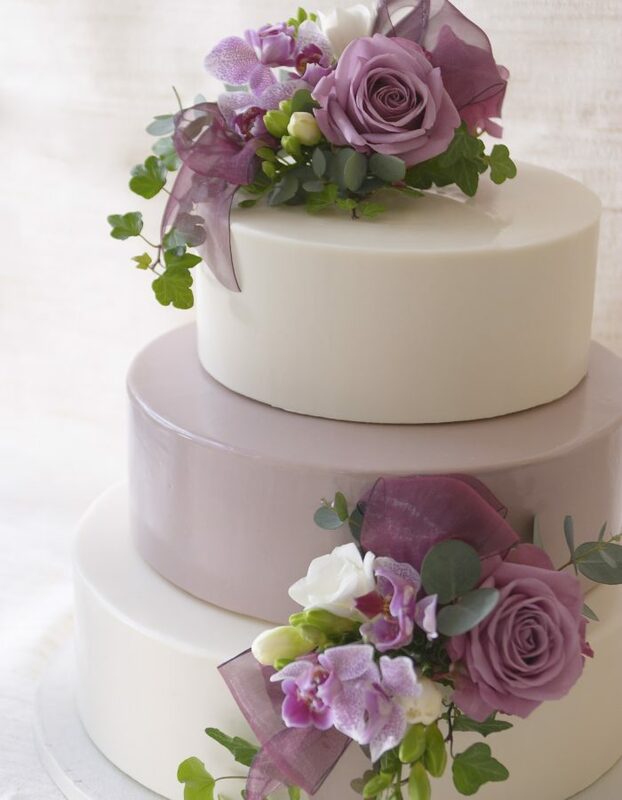 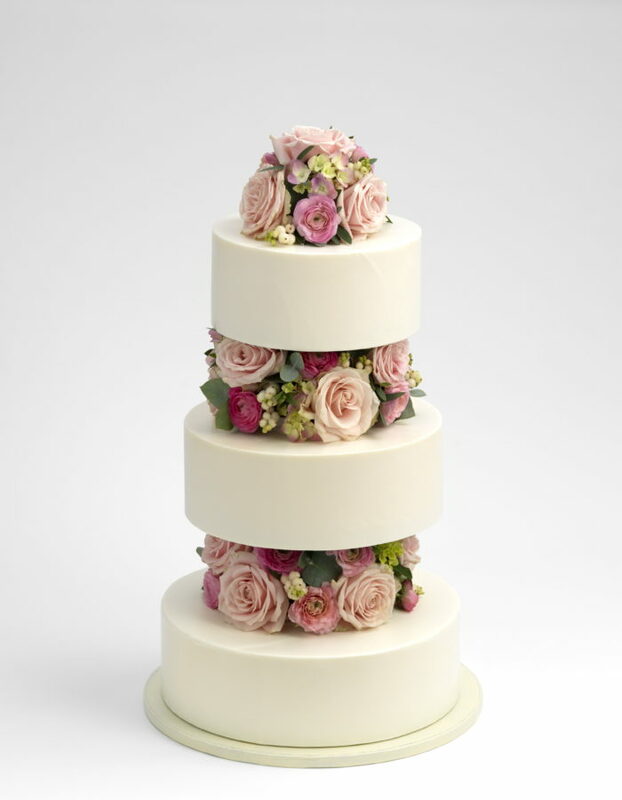 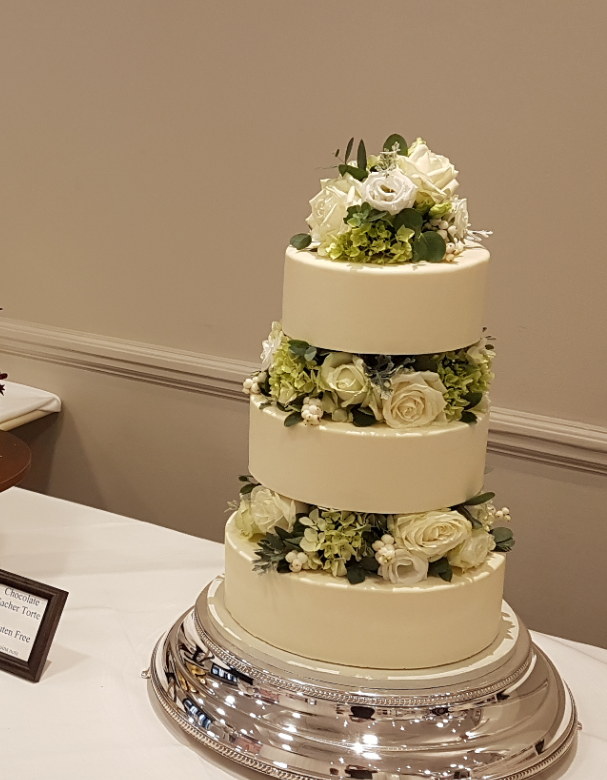 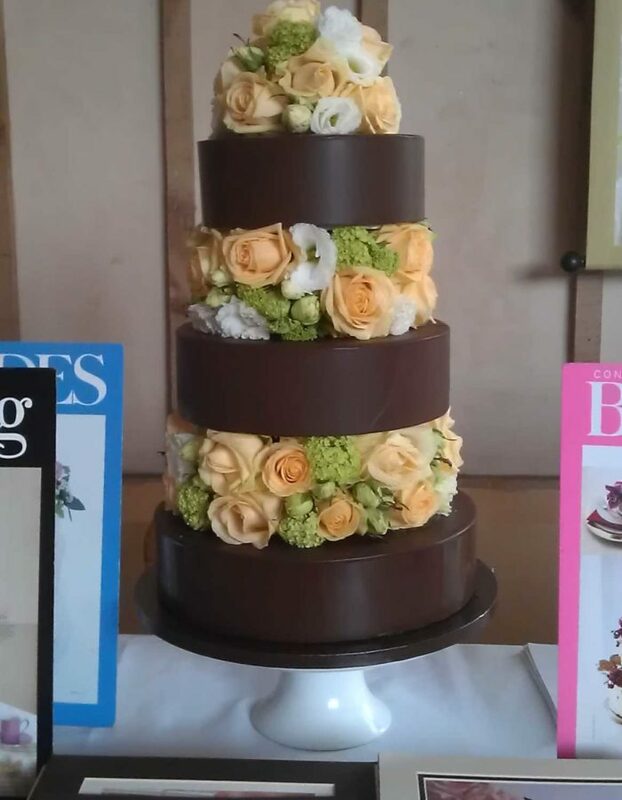 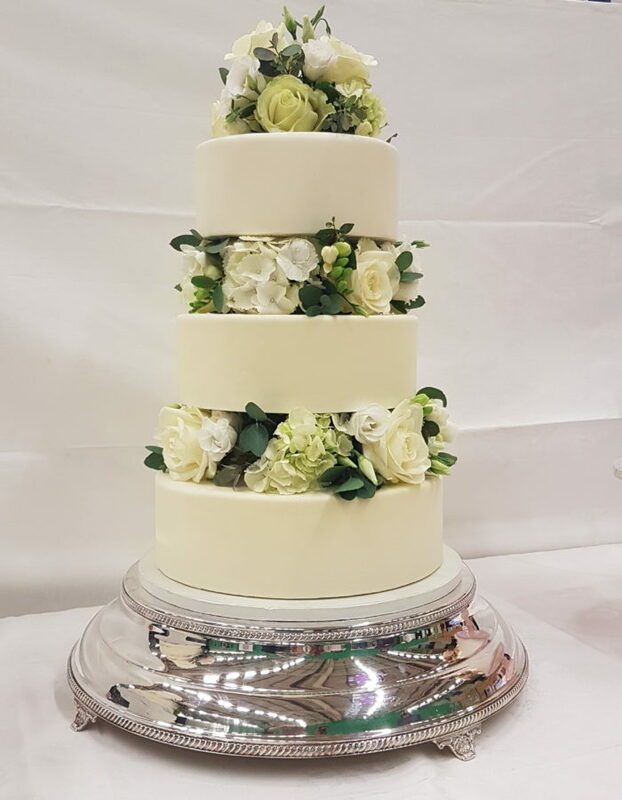 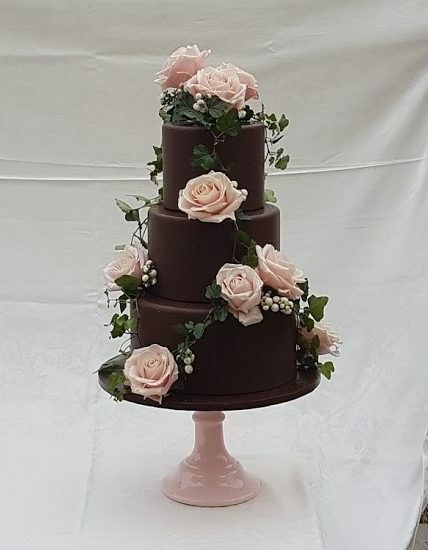 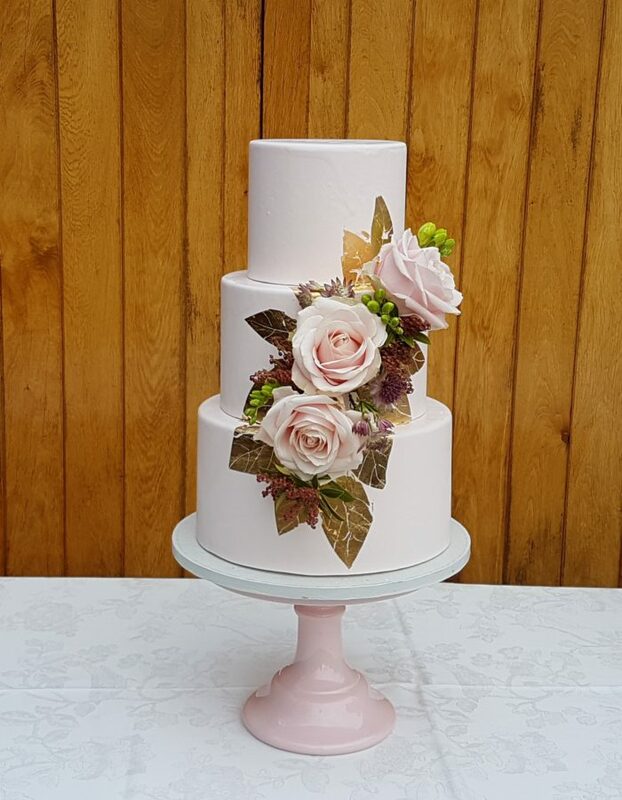 If you are wanting to have something to cut into you could have a little 5” cake with a smooth white or dark chocolate finish on the top of the stand finished with matching fresh flowers. 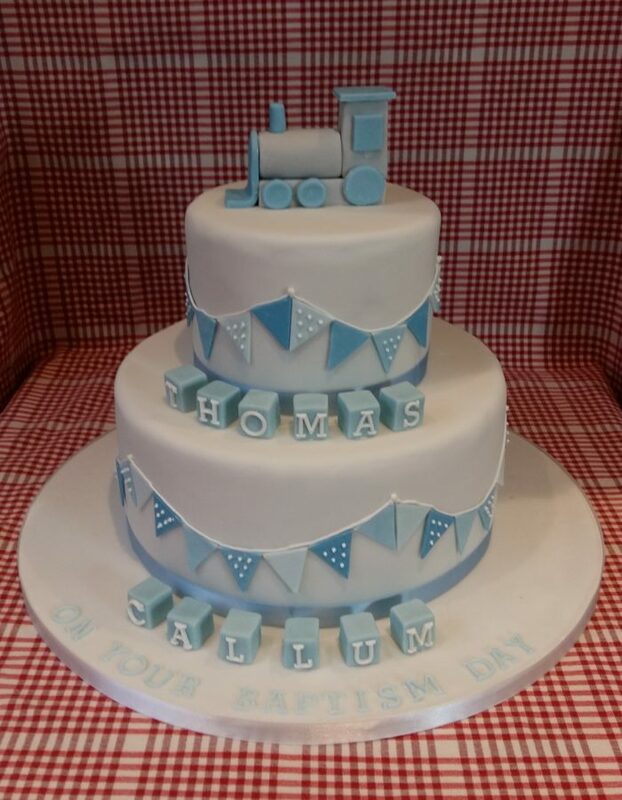 Do ask for more shapes and sizes we are adding to this range. 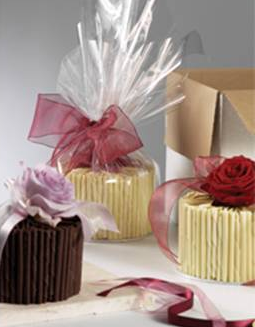 Chocolate Boxes form £3.50 each depending on the number ordered, number of flavours and decoration. 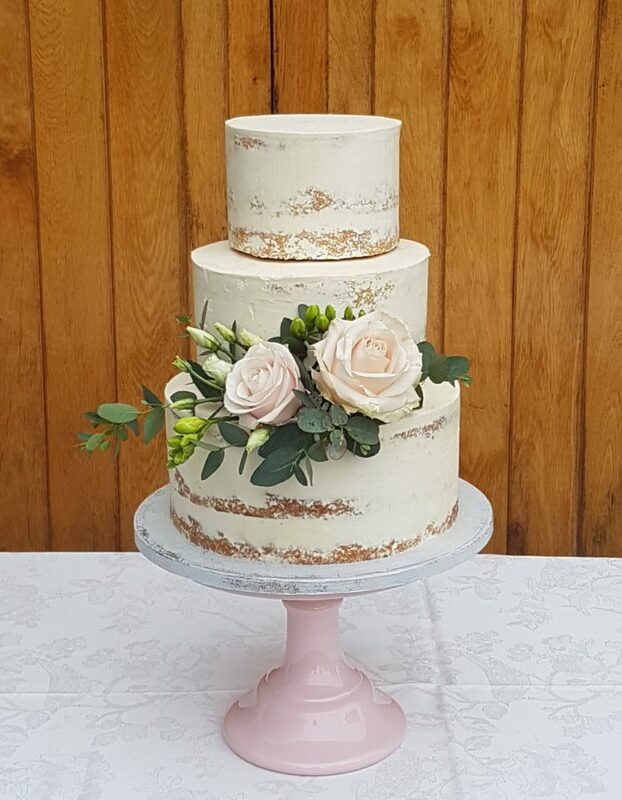 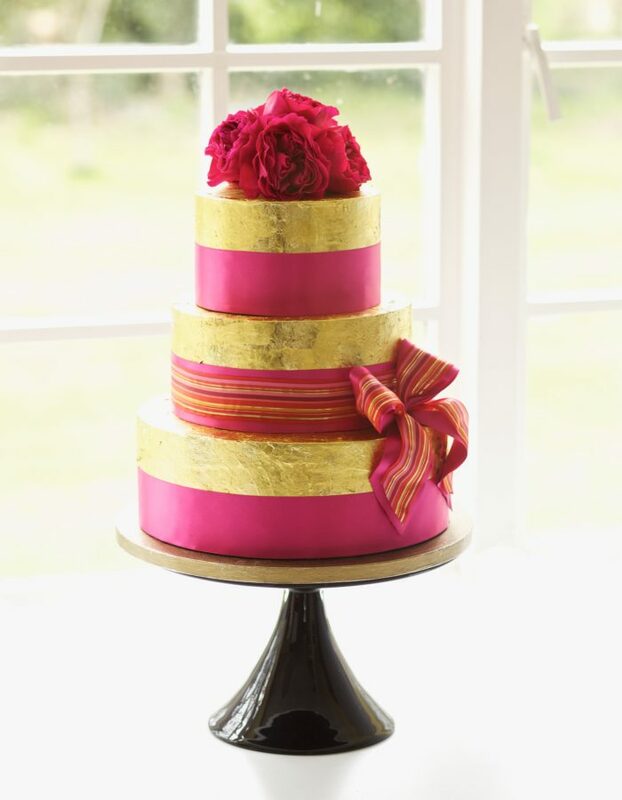 A fab modern rustic look to your cake. 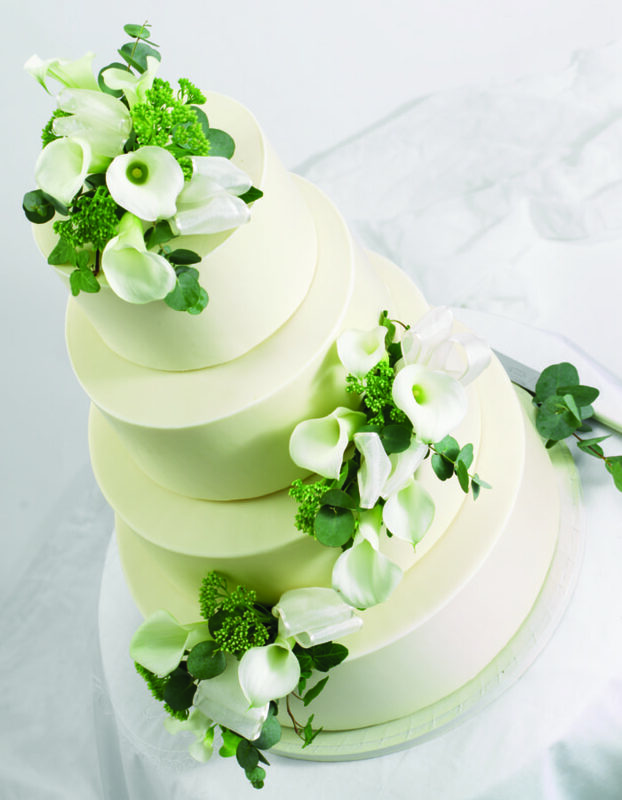 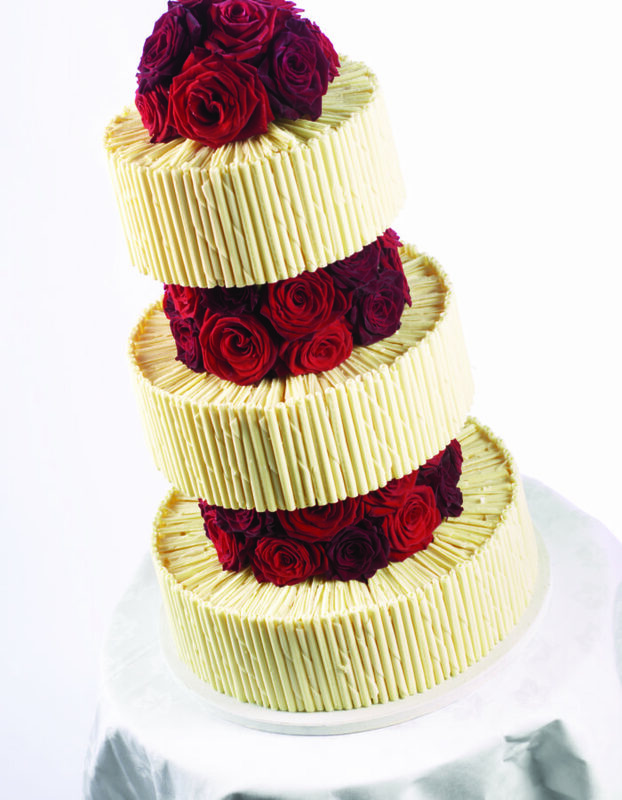 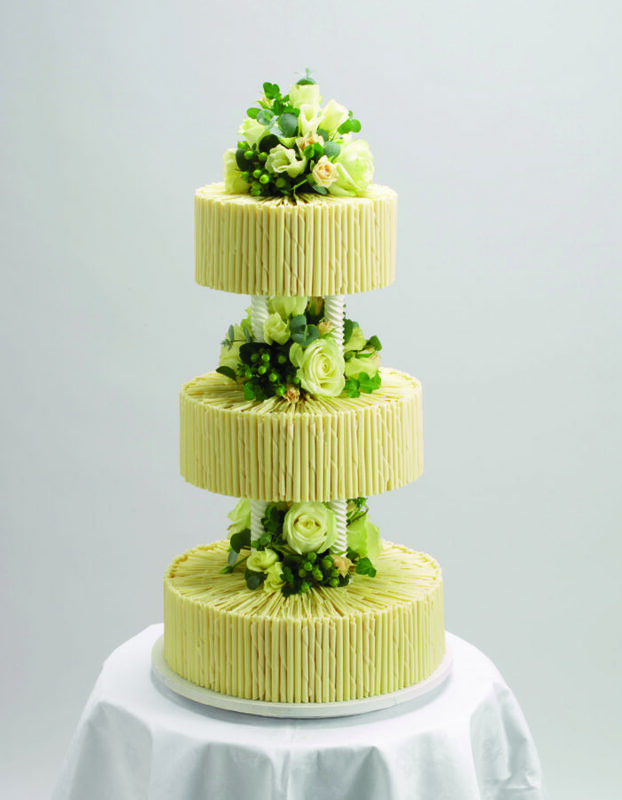 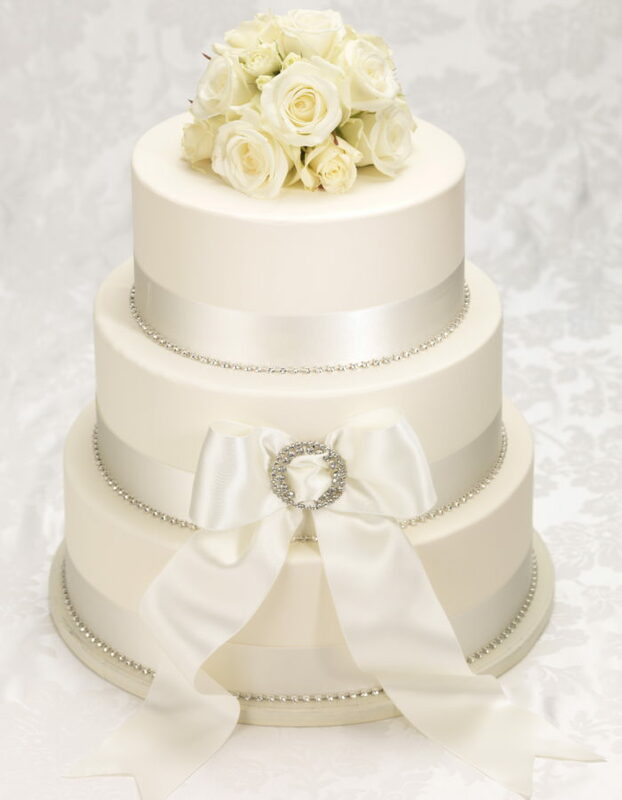 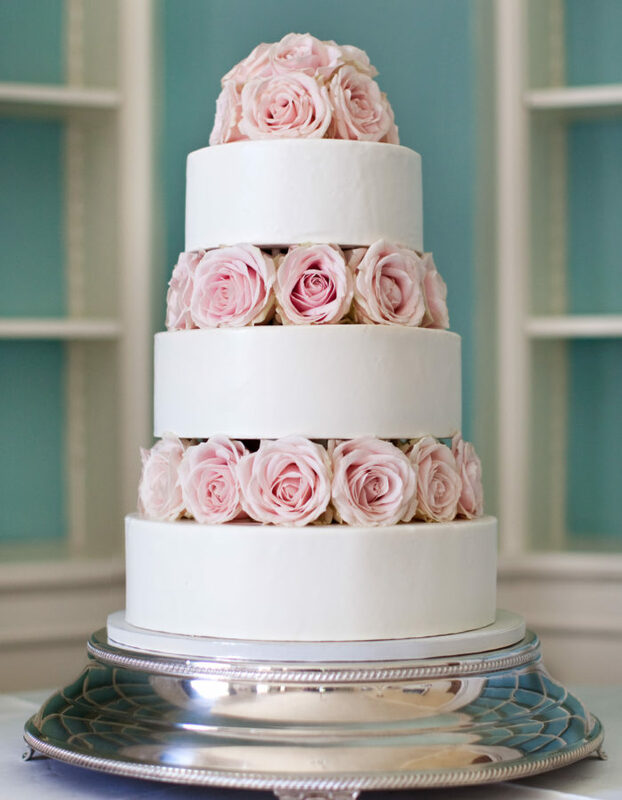 We use an Italian Meringue buttercream for a delightfully smooth finish to our Semi Naked Cakes. 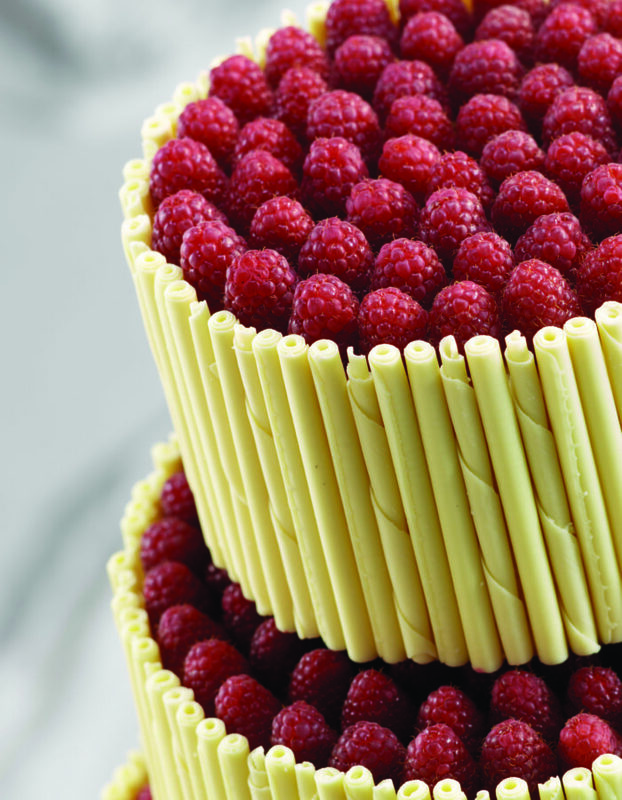 Alternatively, why not go for a chocolate Sacher Torte filled with a summer berry buttercream. 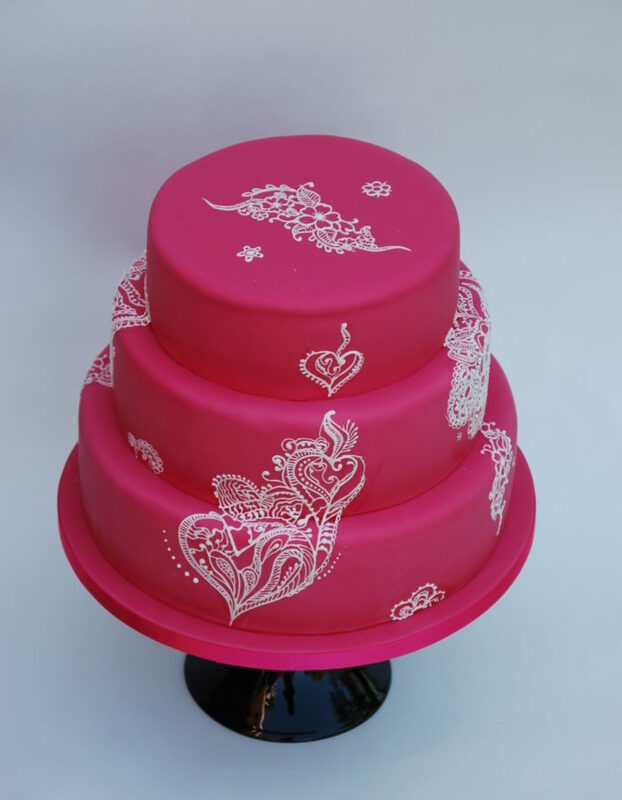 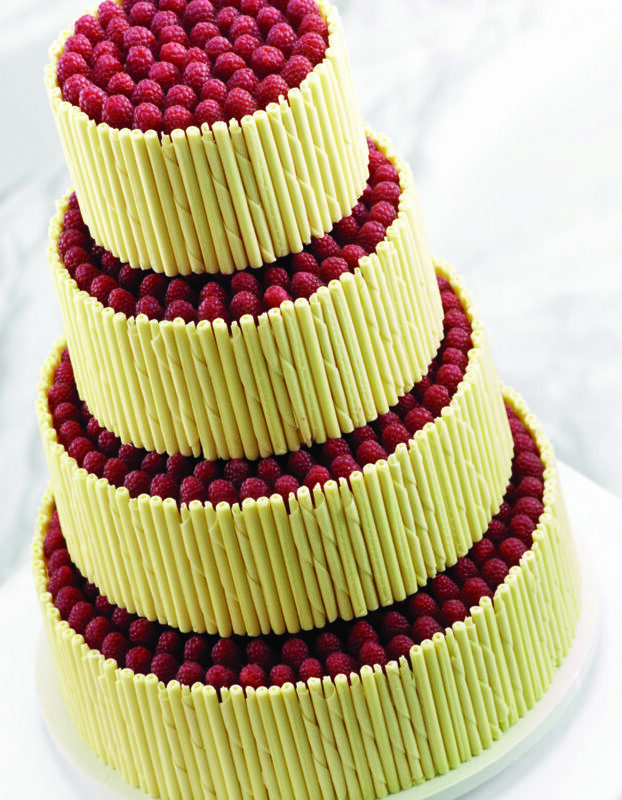 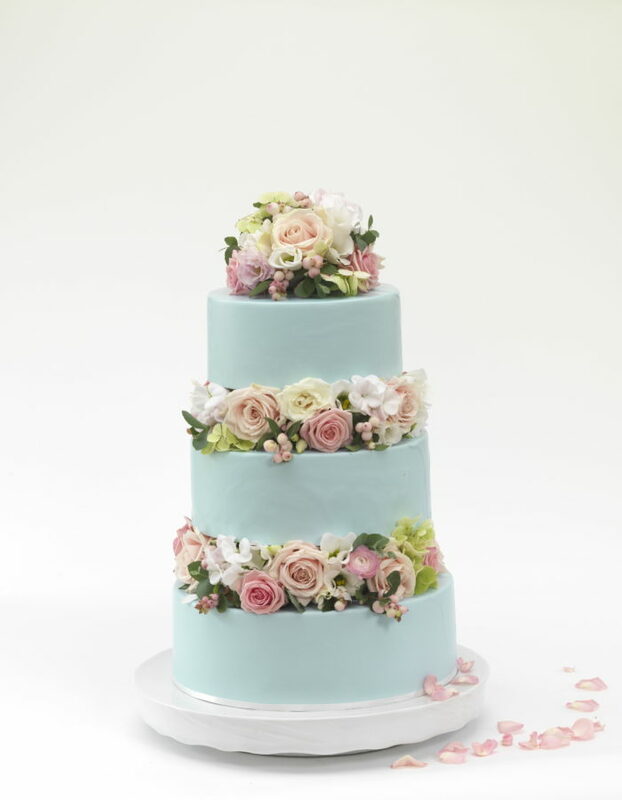 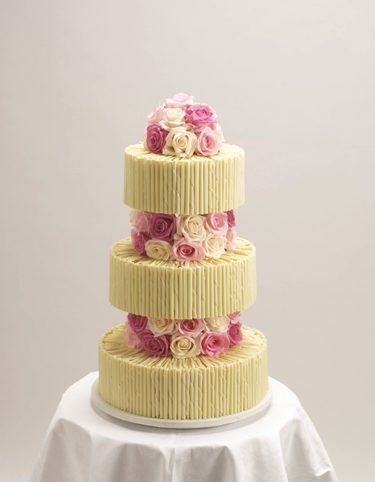 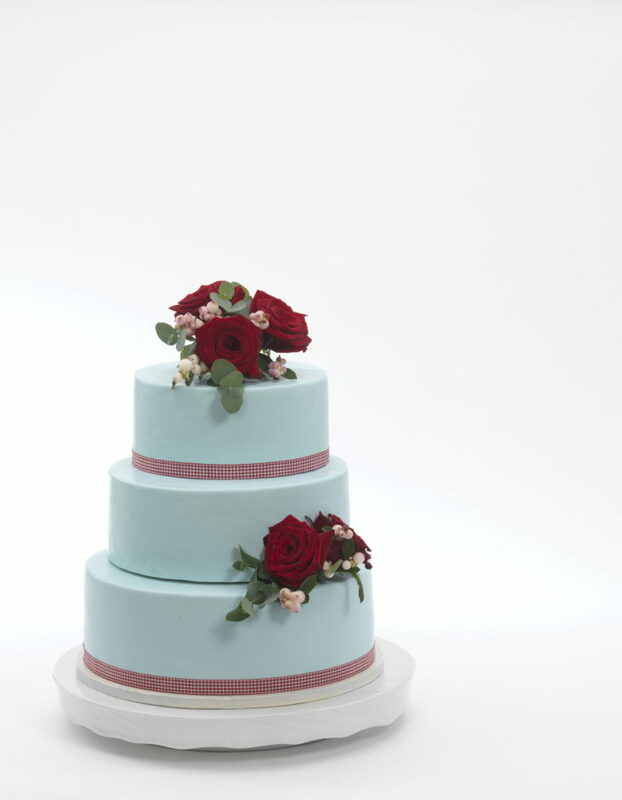 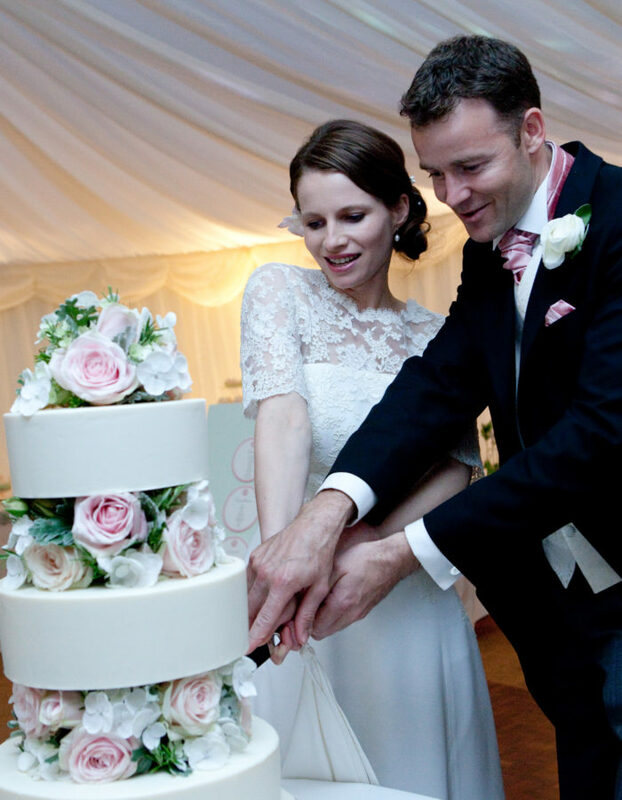 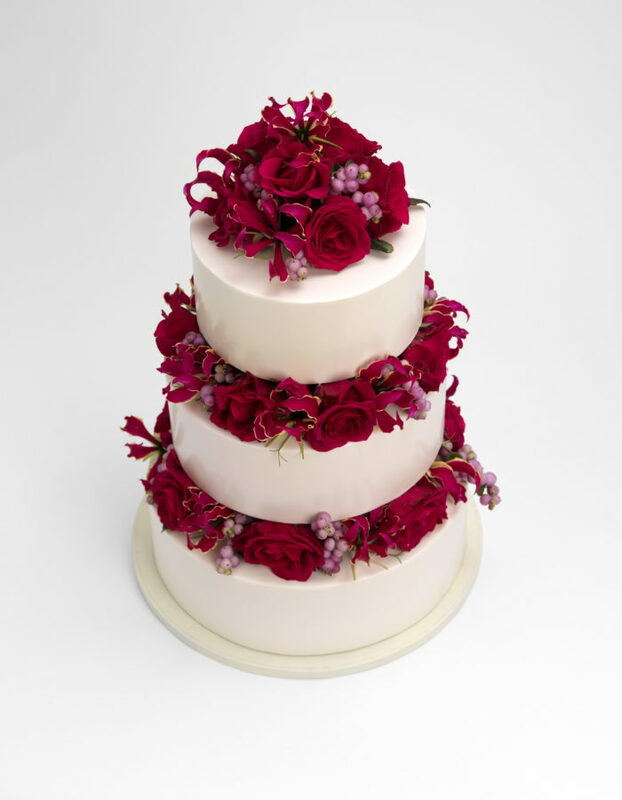 You can even choose to add colour to one of the tiers on your cake for a unique and contemporary look. 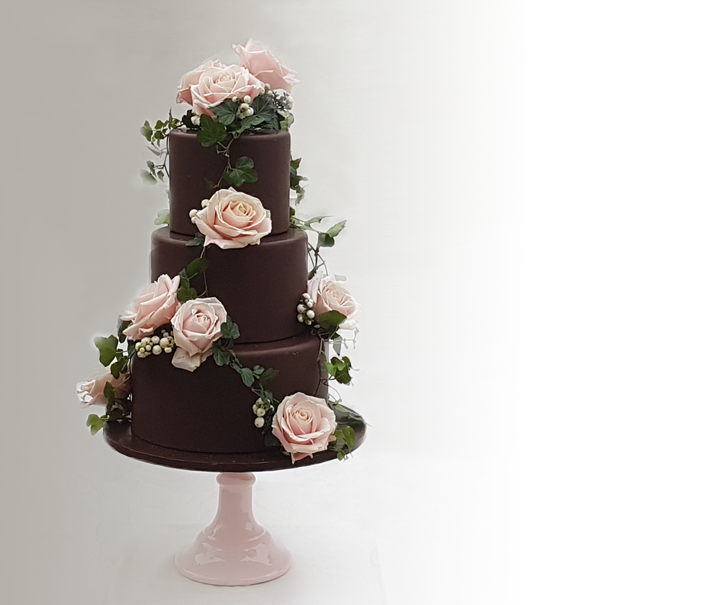 We are able to expertly mix the colour to the smooth chocolate to complement your colour scheme using a sample of your fabric or ribbon. 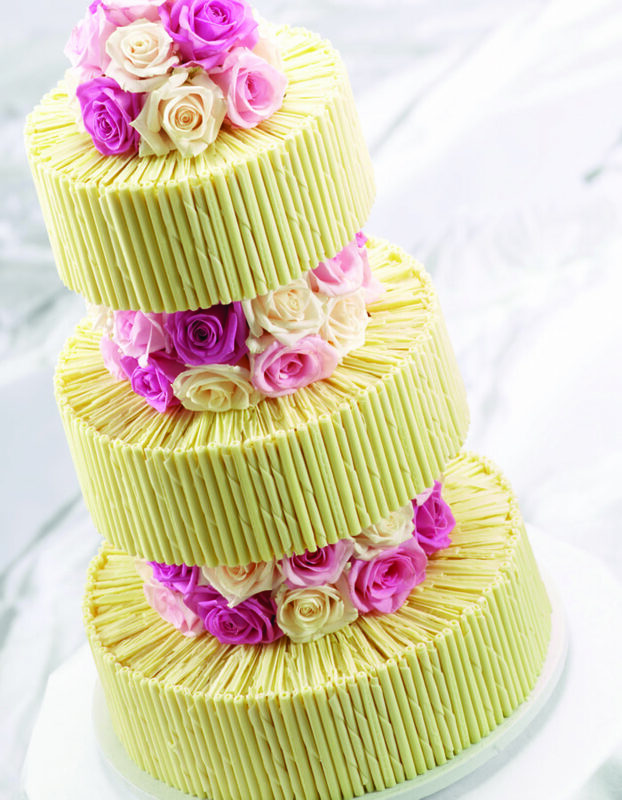 You may wish to have one or all of the tiers coloured, as little or as much colour is possible , maybe just a slight hint or all out colour!! 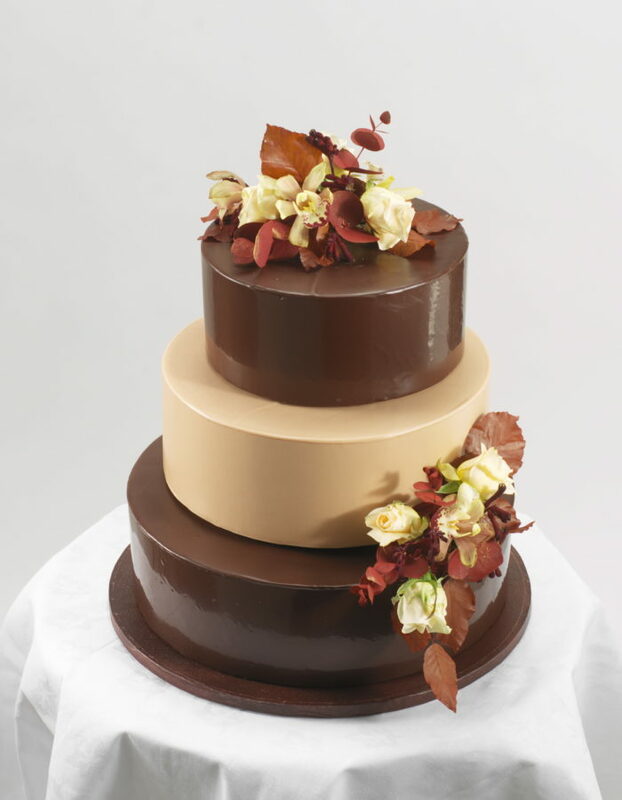 Pure 24ct gold or pure silver leaf is very delicately placed on top of a white or dark chocolate ganache. 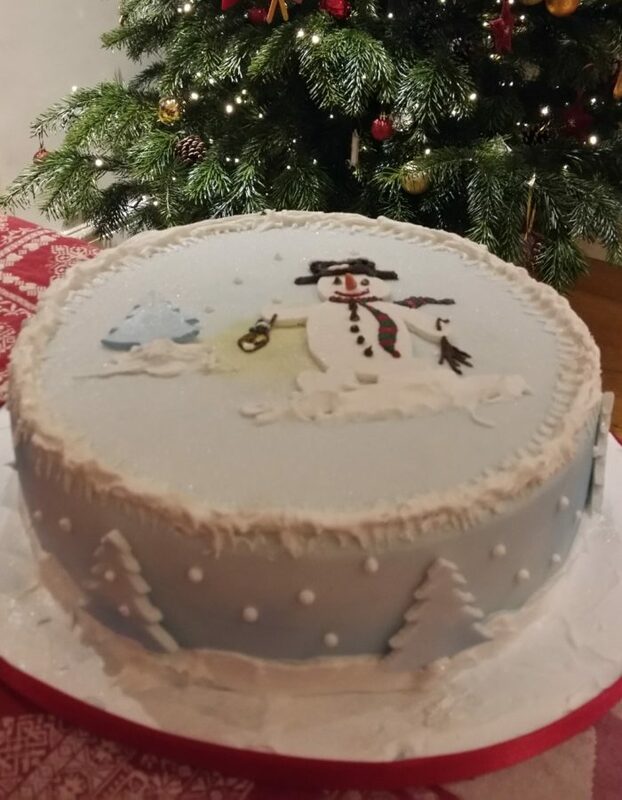 It is totally edible and very special!! 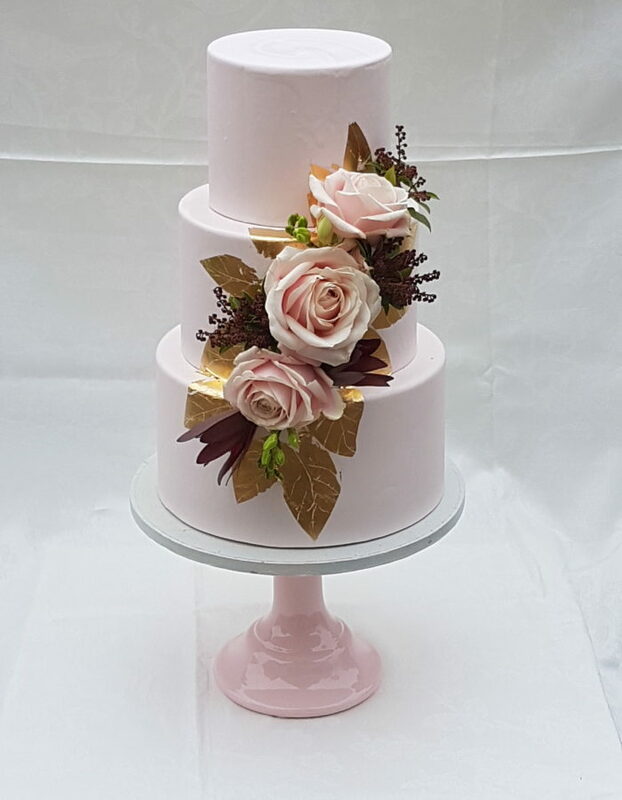 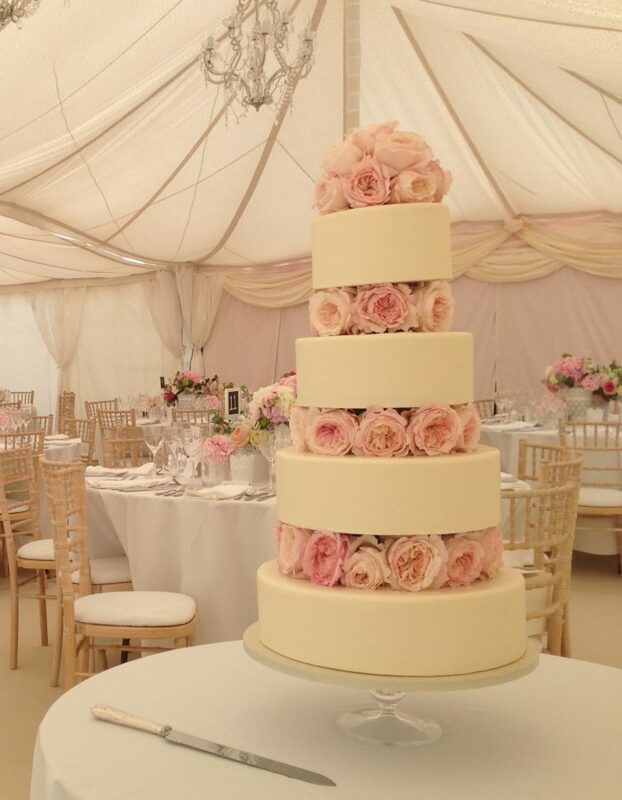 There are various styles including an antique look suiting natural, wildflowers / twigs and berries or go for a pristine gold or silver coverage with perfectly arranged layers or domes of stunning roses. 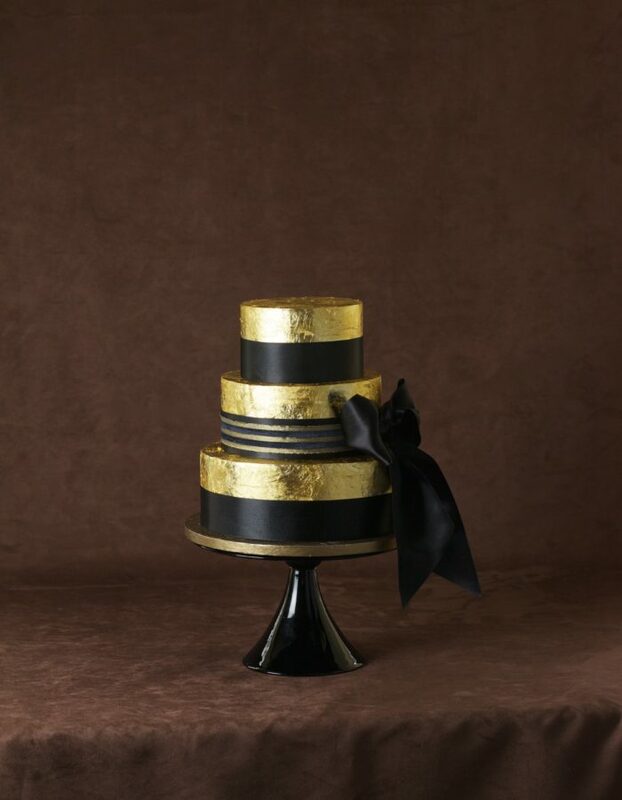 Alternatively, an art deco look of gold leaf with stylish black ribbon. 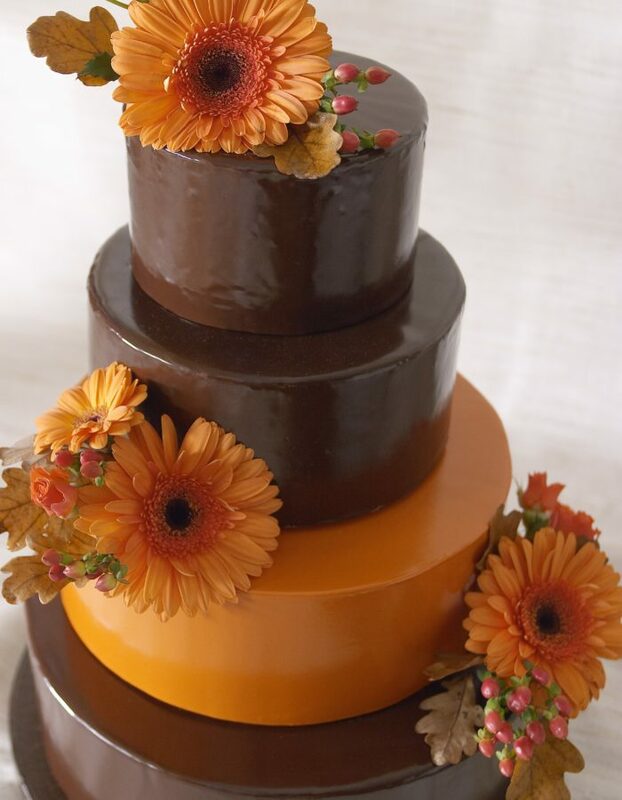 Smooth dark chocolate is poured on top of our chocolate ganache which is covering our chocolate Sacher torte, carrot or a cake of your choice!! 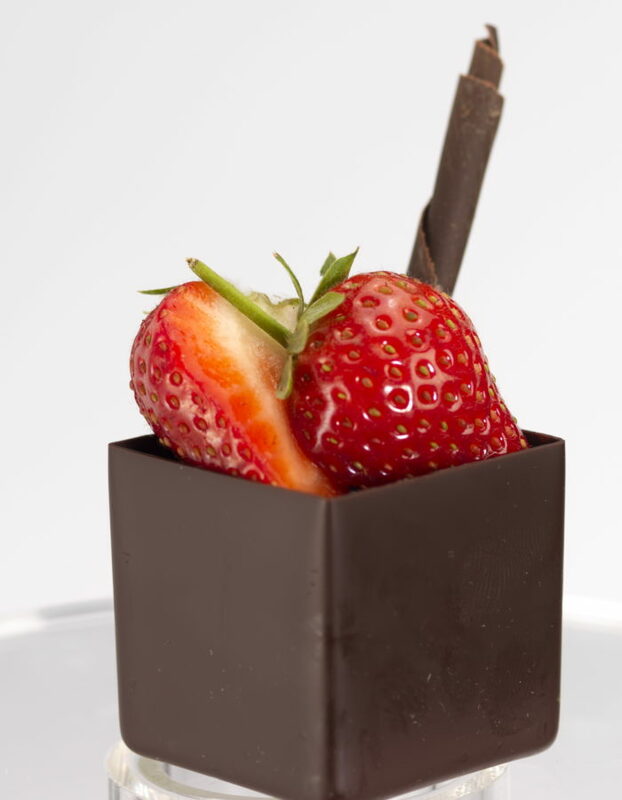 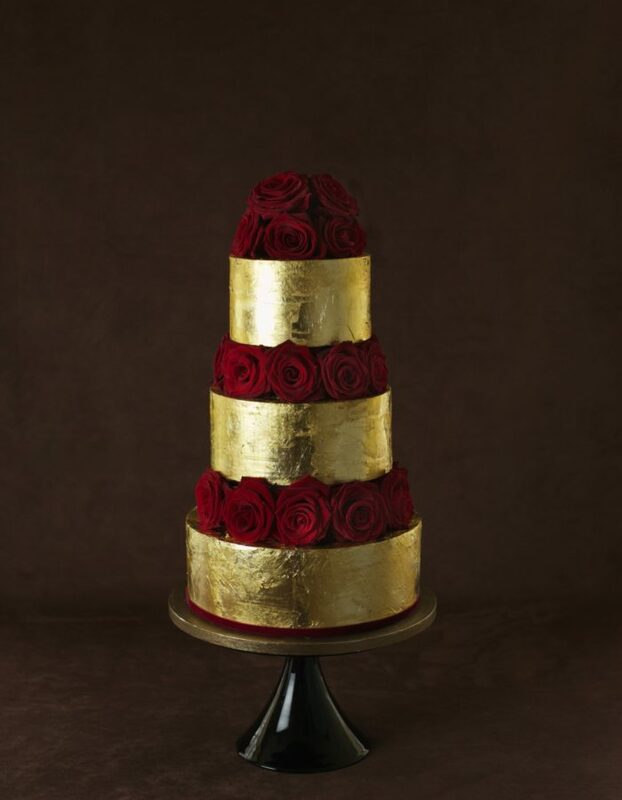 Giving a very decadent rich mouthwatering look to your cake, a great chocolate statement! 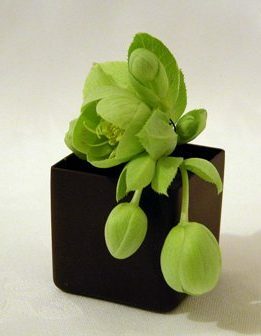 Ideal as a backdrop for colourful flowers or subtle shades. 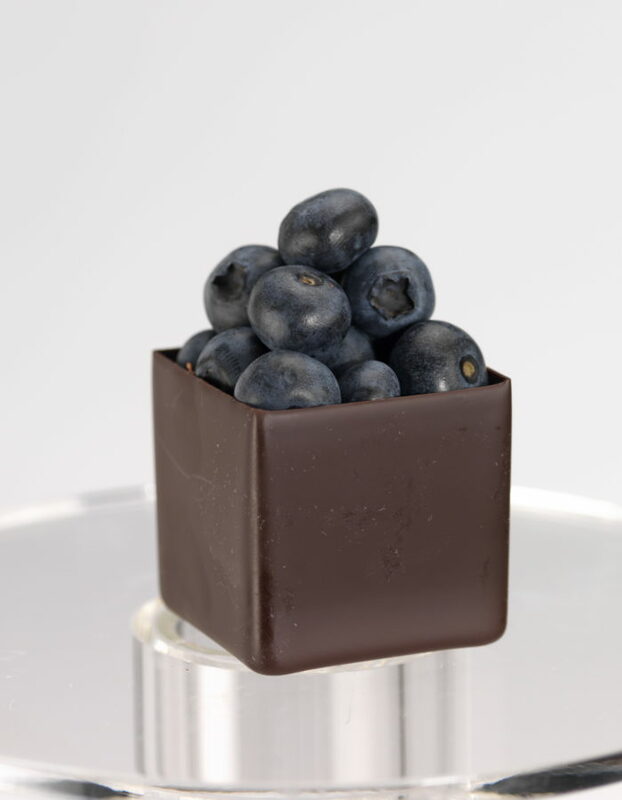 Fruits also work deliciously with dark chocolate. 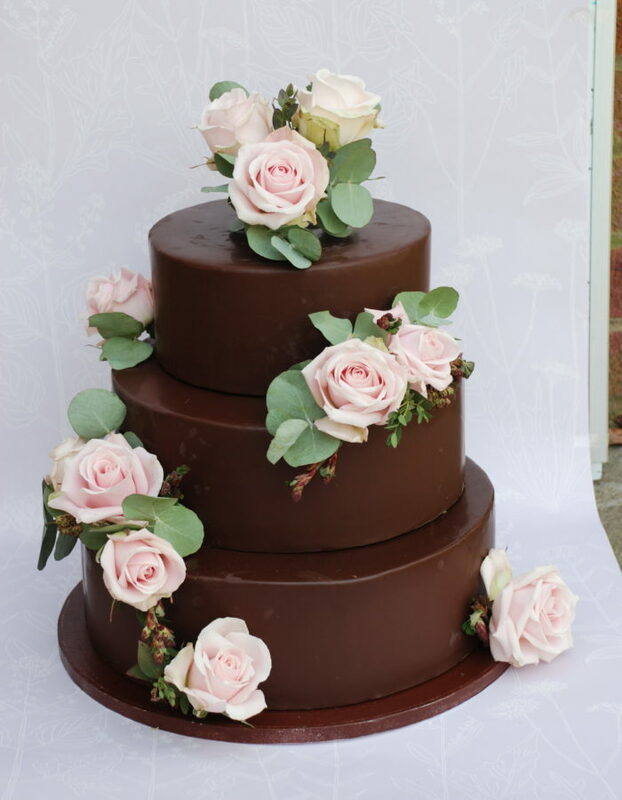 We are highly skilled in creating perfect shapes and structured designs out of chocolate to make an impact with added texture and style for your cake. 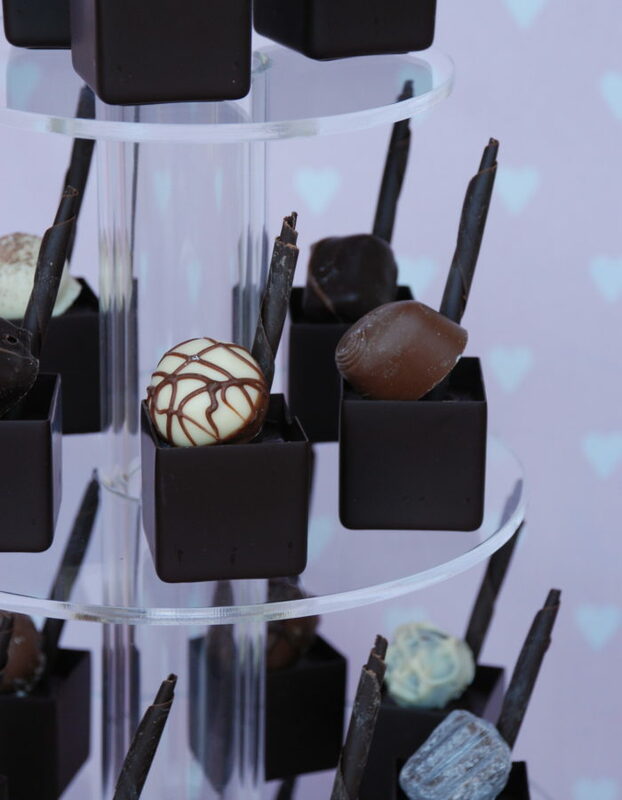 We can discuss your ideal look and create stylish structural chocolate works in a range of finishes including shards, wraps or curls that both look and taste amazing. 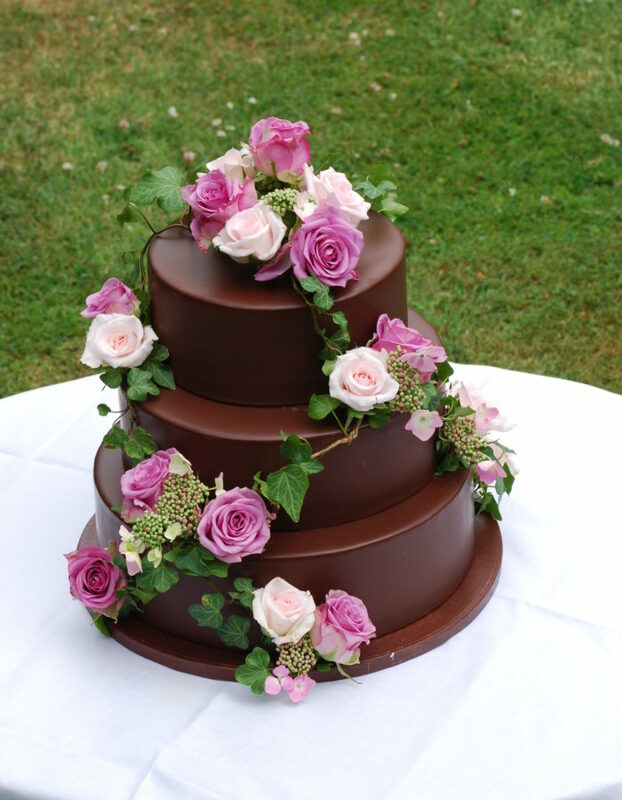 The chocolate curl cakes – great for a rustic look either decorated with fresh flowers and fruits or just around the sides and filled with fresh raspberries or a mix of summer fruits. 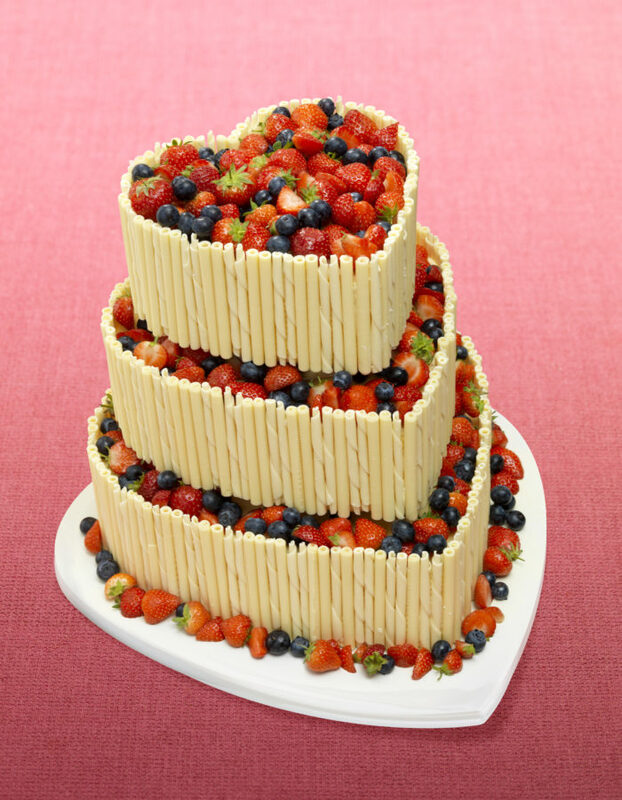 Alternatively just go for that chocolate and summer berry combination. 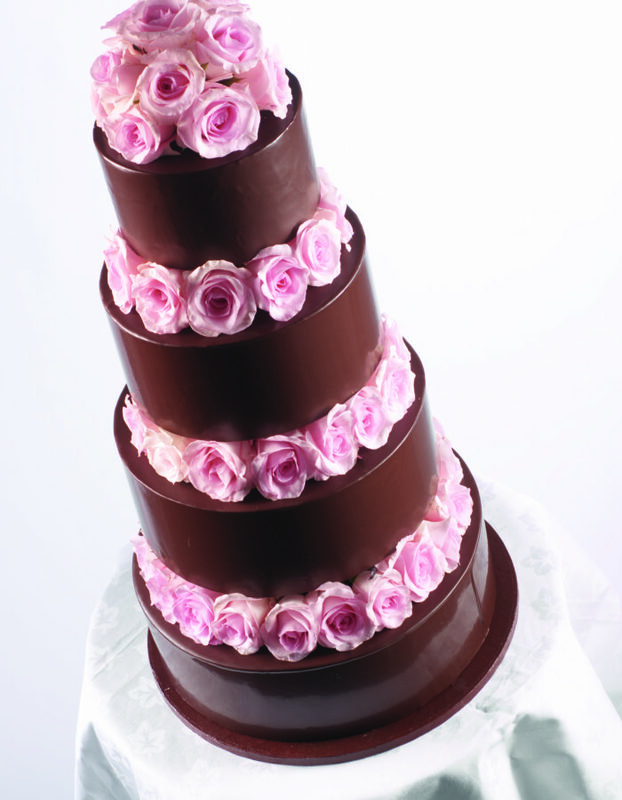 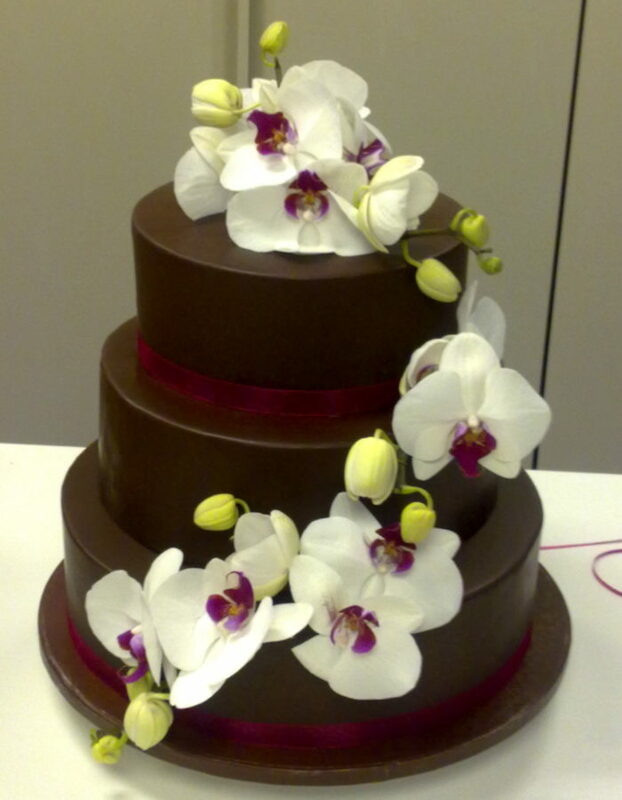 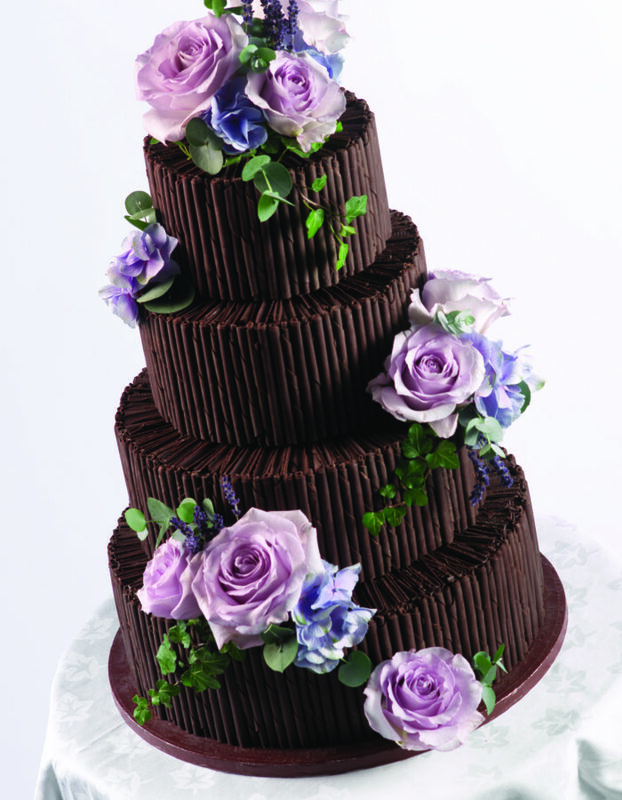 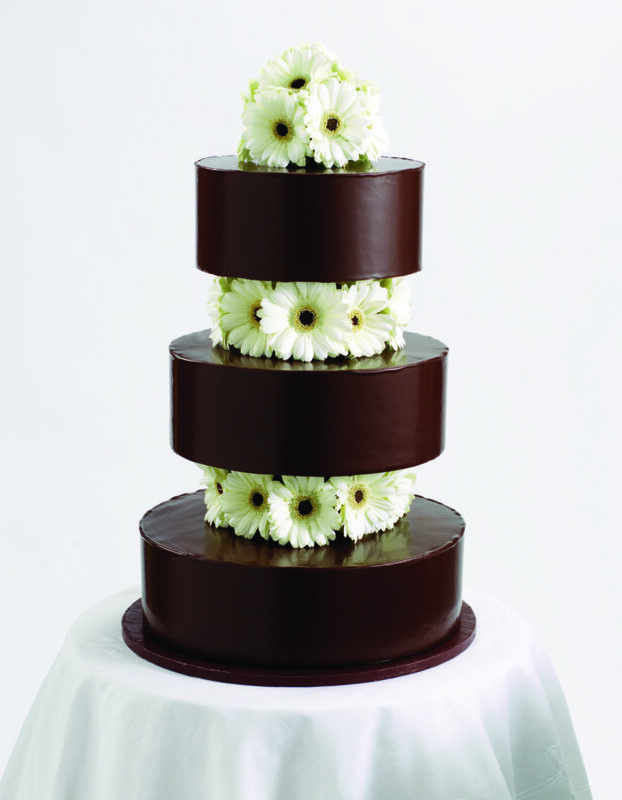 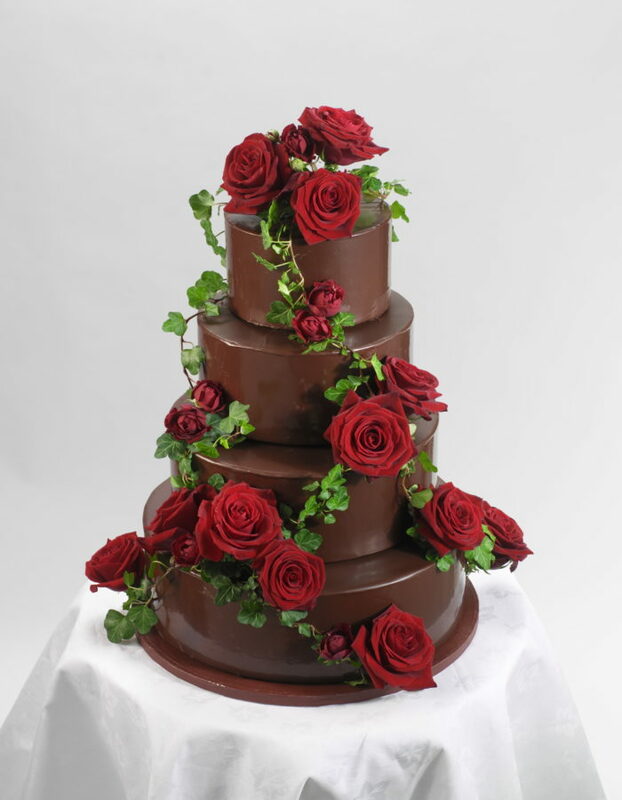 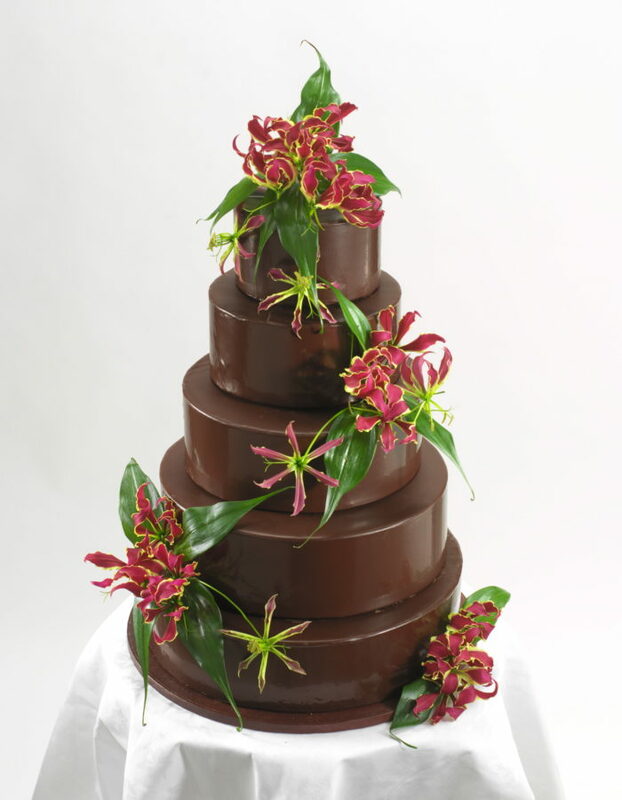 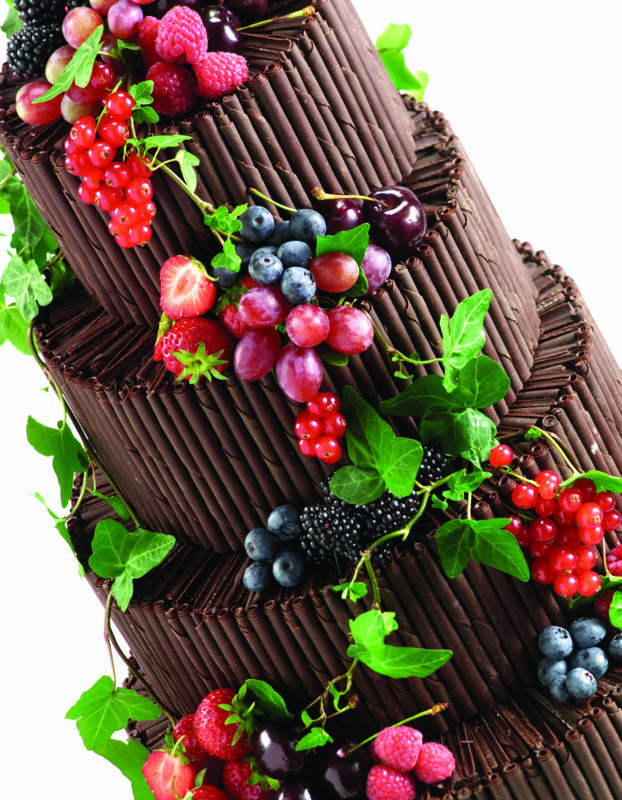 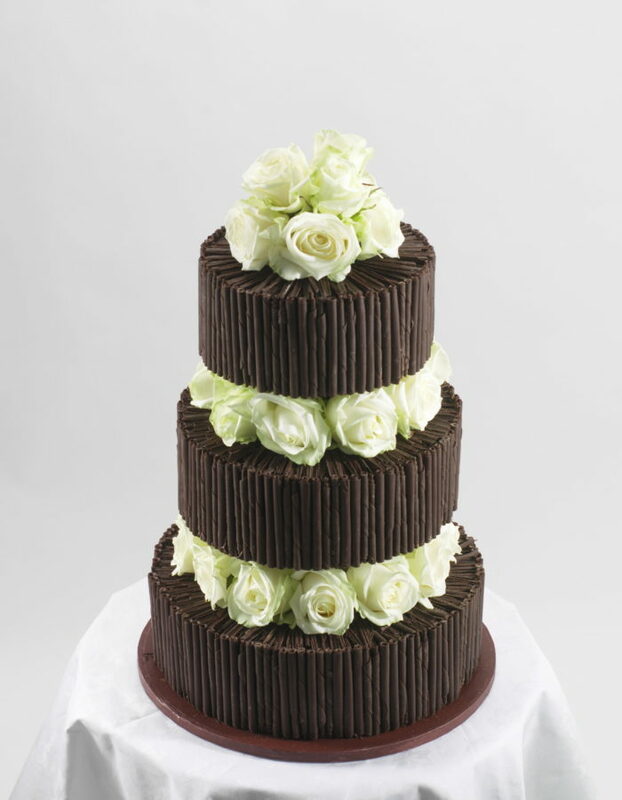 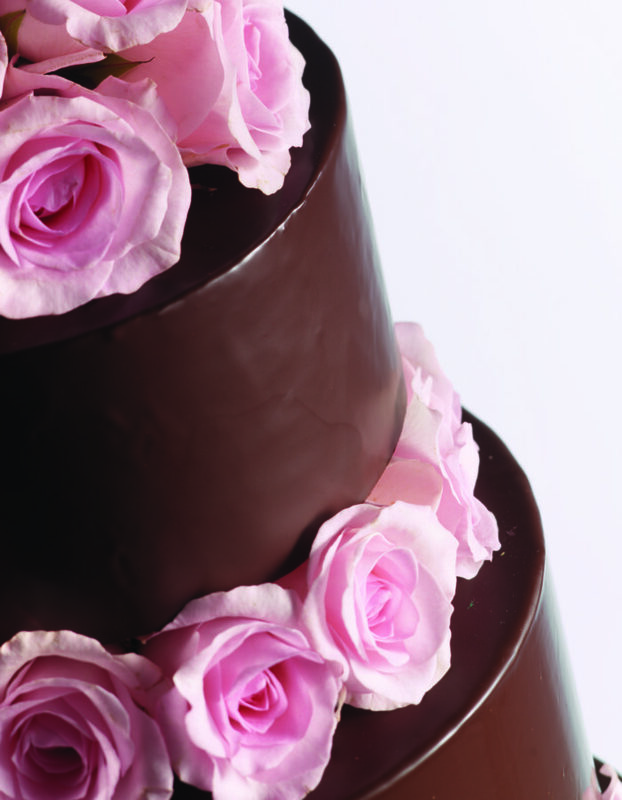 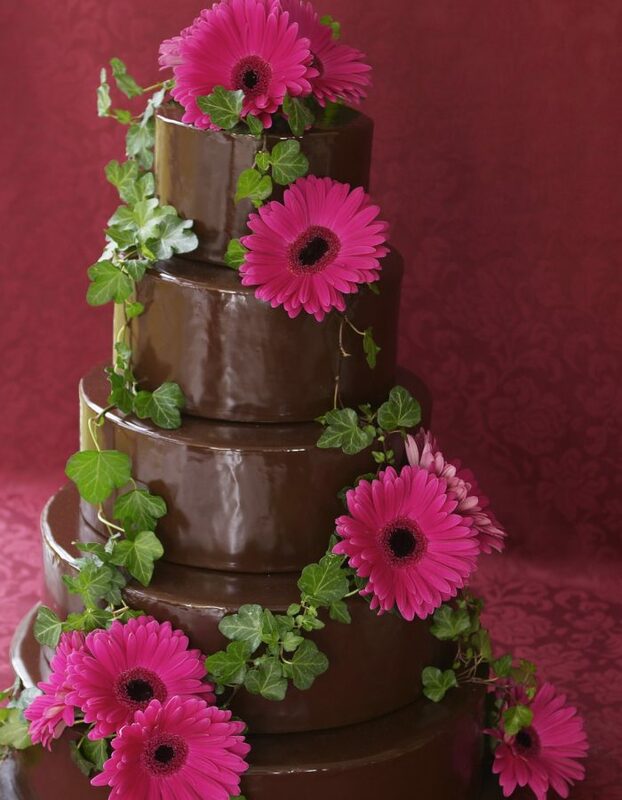 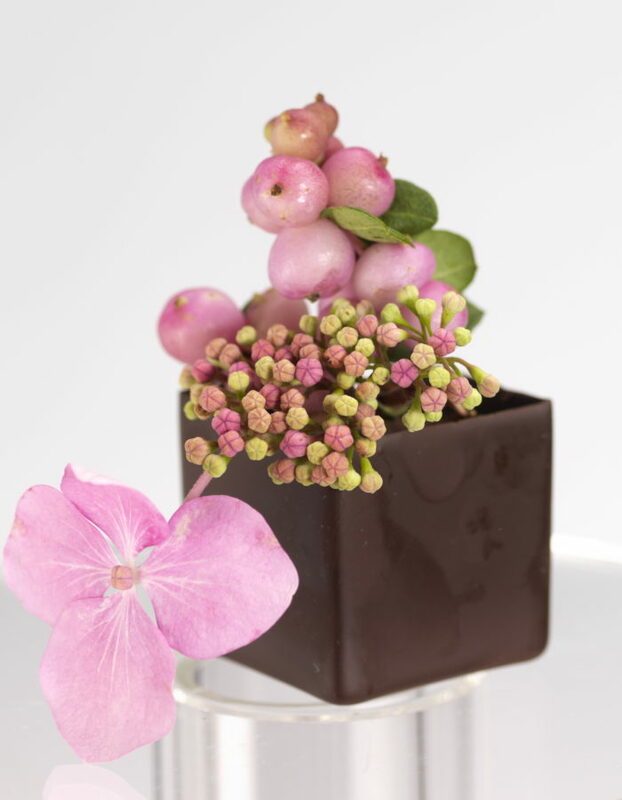 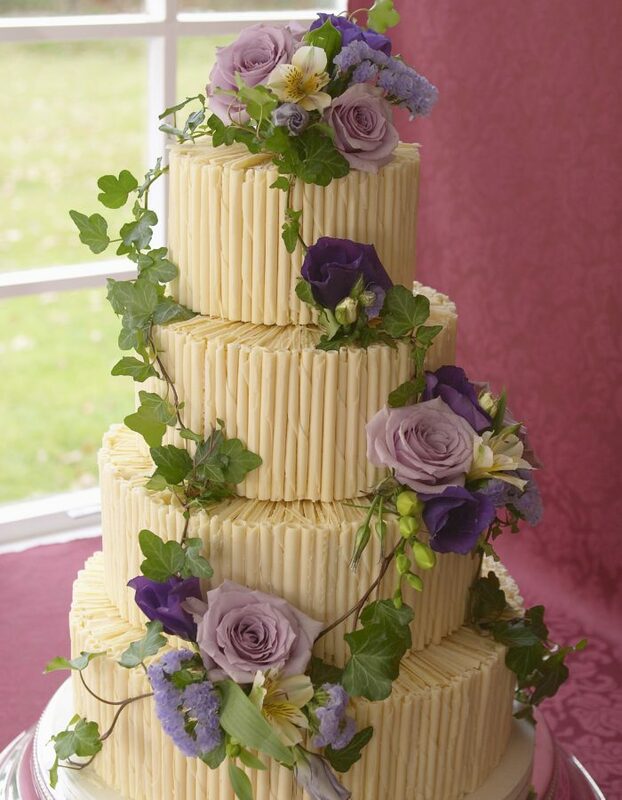 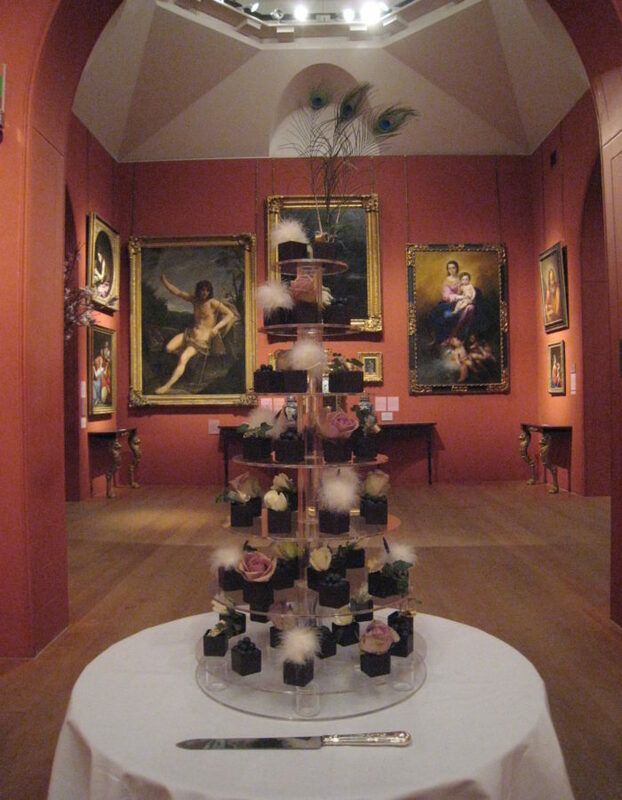 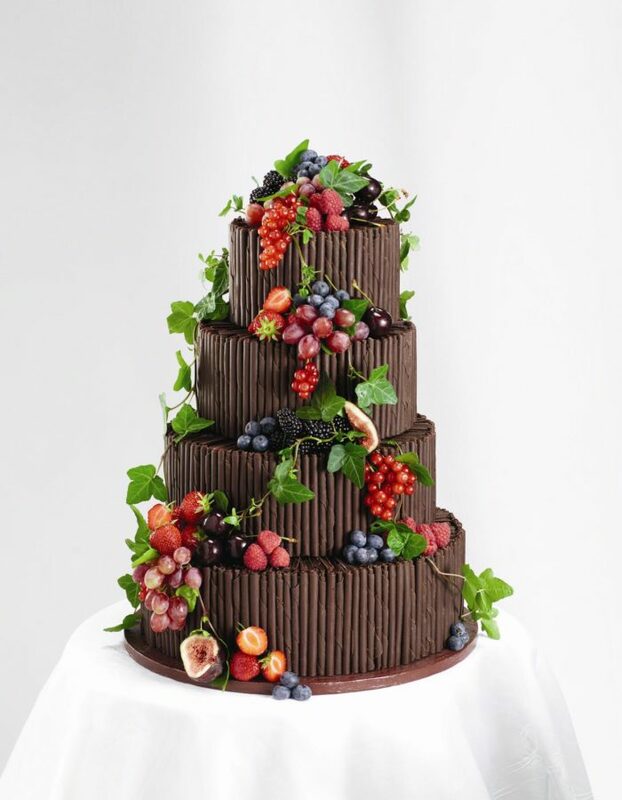 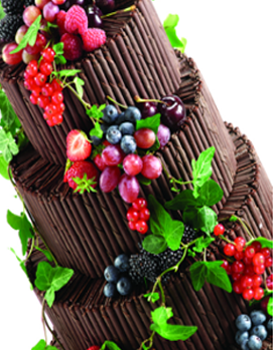 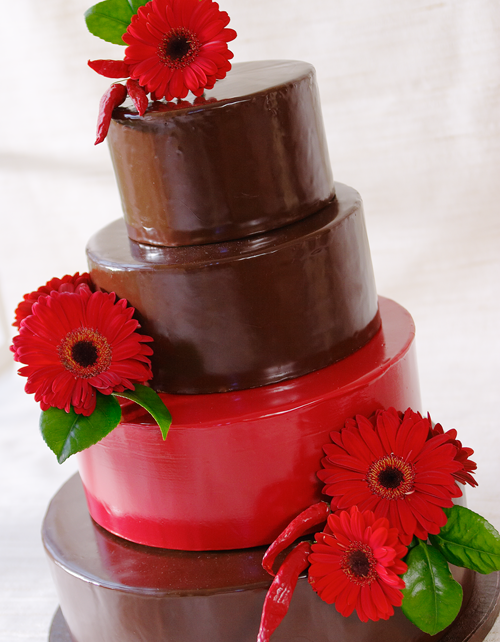 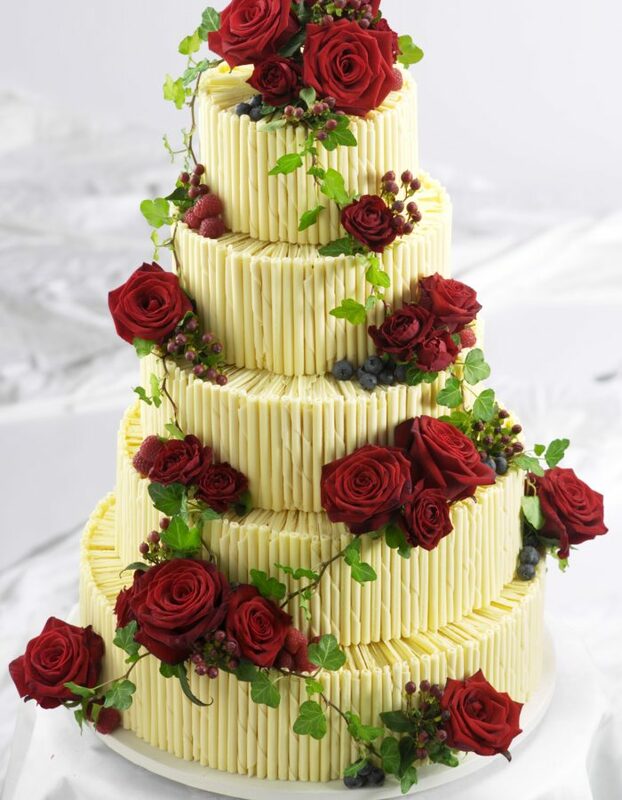 A chocolate wall cake- dark or white chocolate is wrapped carefully around each cake and filled with flowers or fruits. 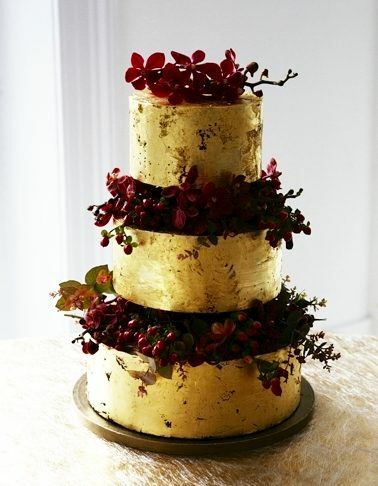 Christmas cake steeped in brandy or an incredibly decadent Vegan chocolate cake for a dinner party. 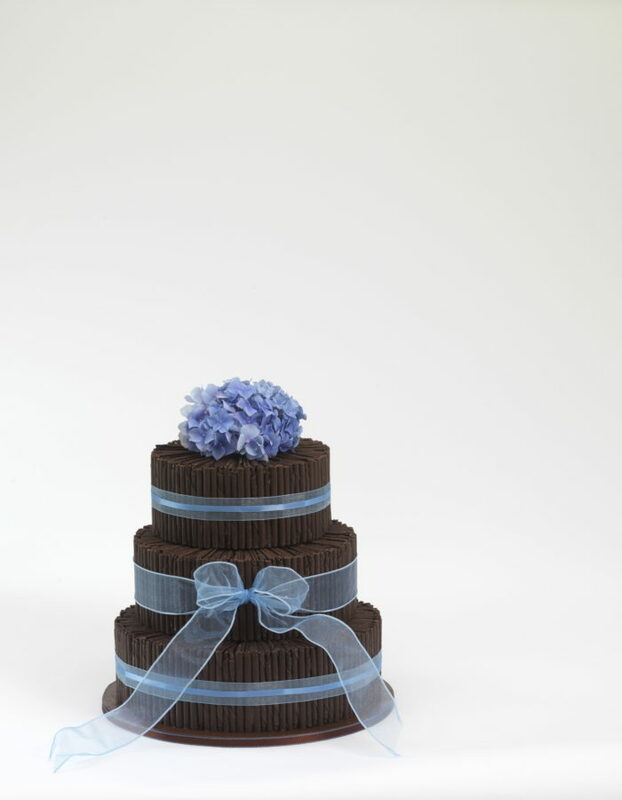 and a slightly nutty bite, with or without a rich chocolate ganache. 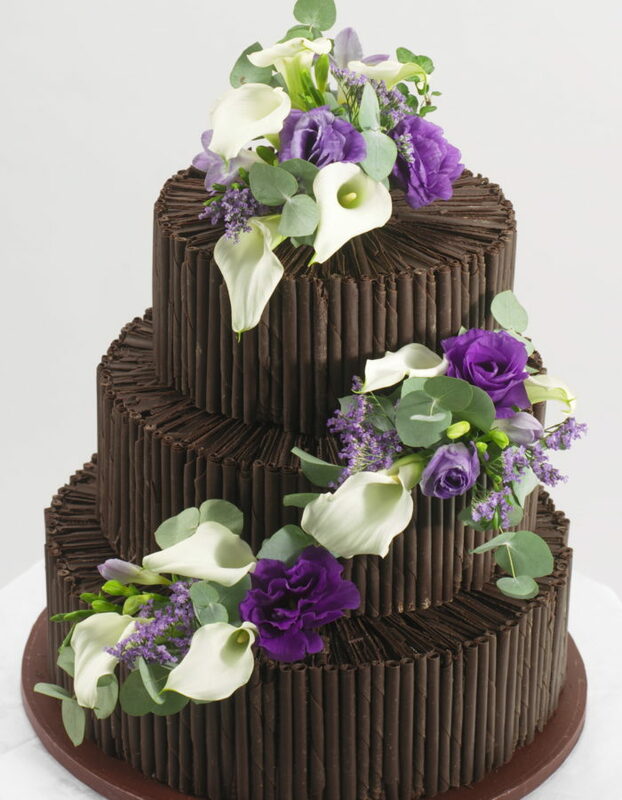 coconut chocolate filling or a chocolate ganache. 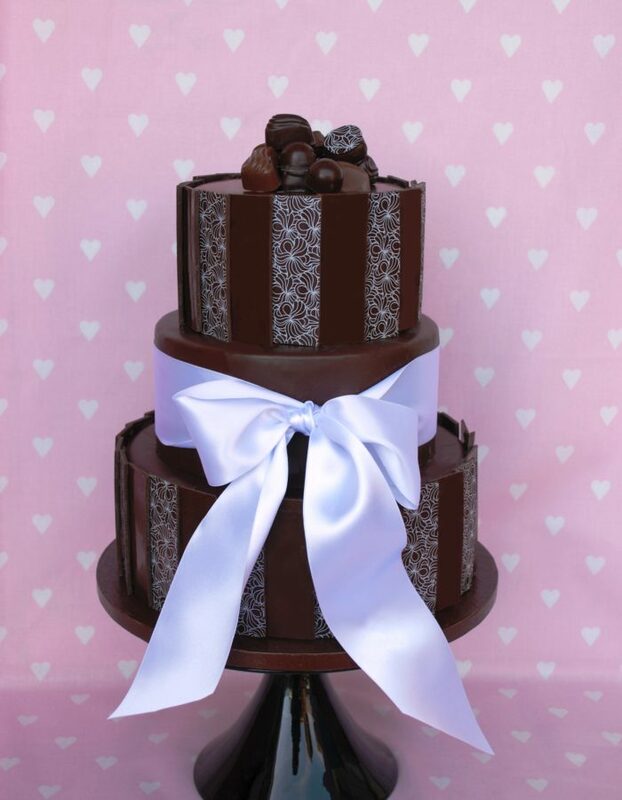 A perfect gift to make an engagement or remember this for an anniversary. 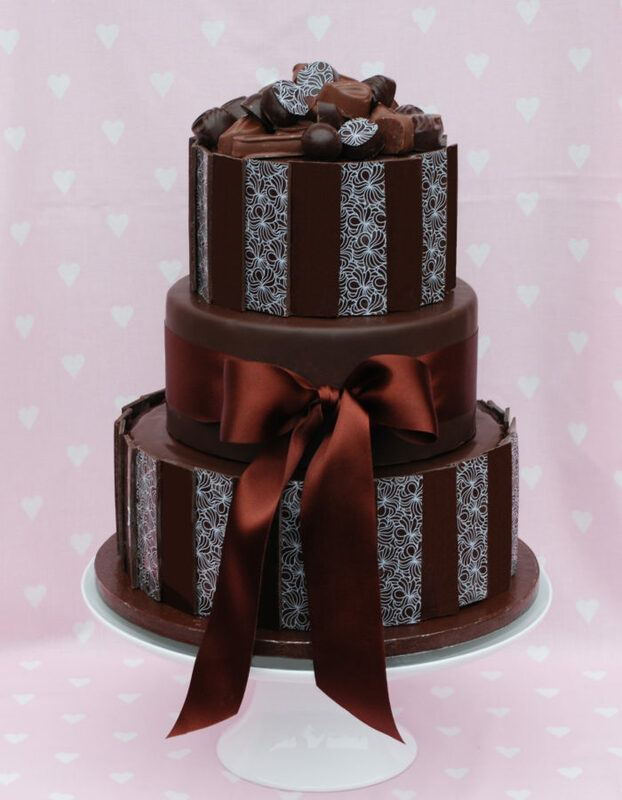 A 6” cake decorated with white/ milk/dark chocolate curls or smooth white/dark chocolate wrapped in cellophane with a bow to match your theme. 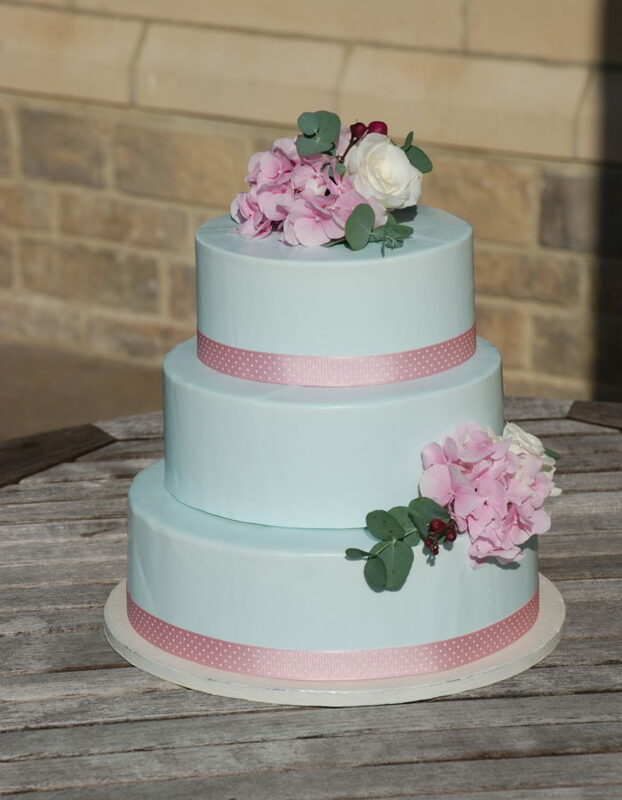 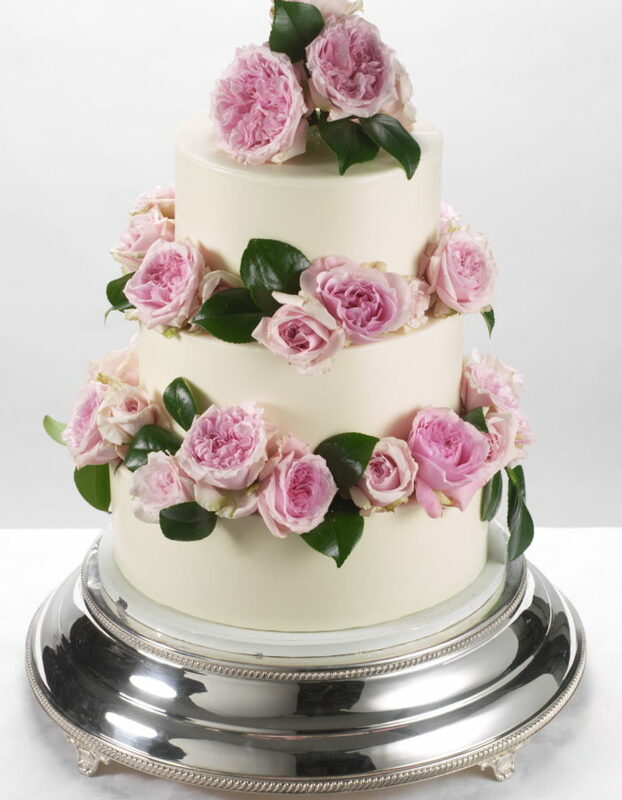 We can make bespoke cakes finished in fondant icing with piping and fresh flowers. 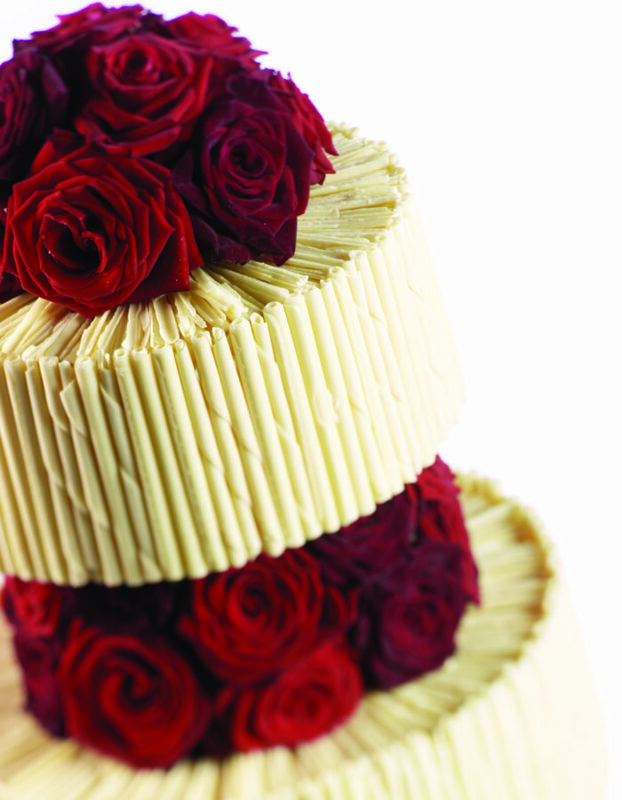 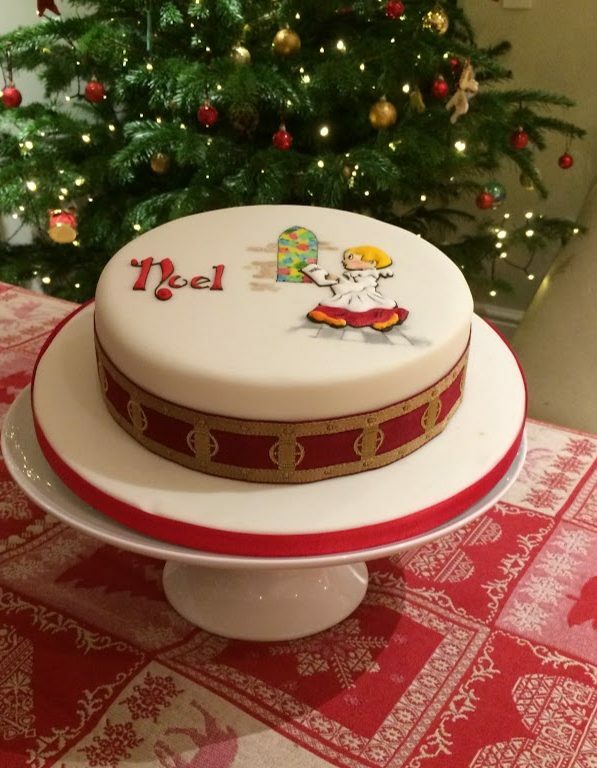 The fillings can be of your choosing covered with or without marzipan and then a smooth fondant icing. 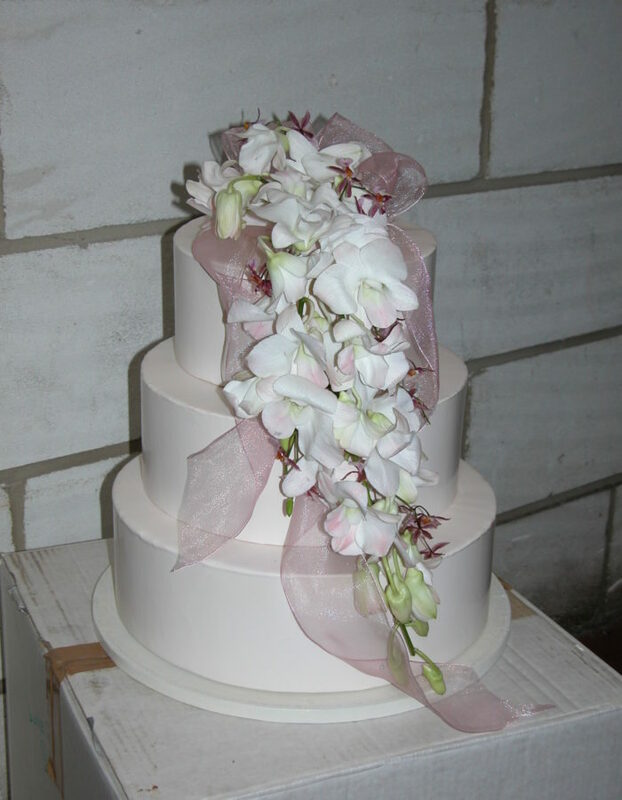 The finish in a design of your choice. 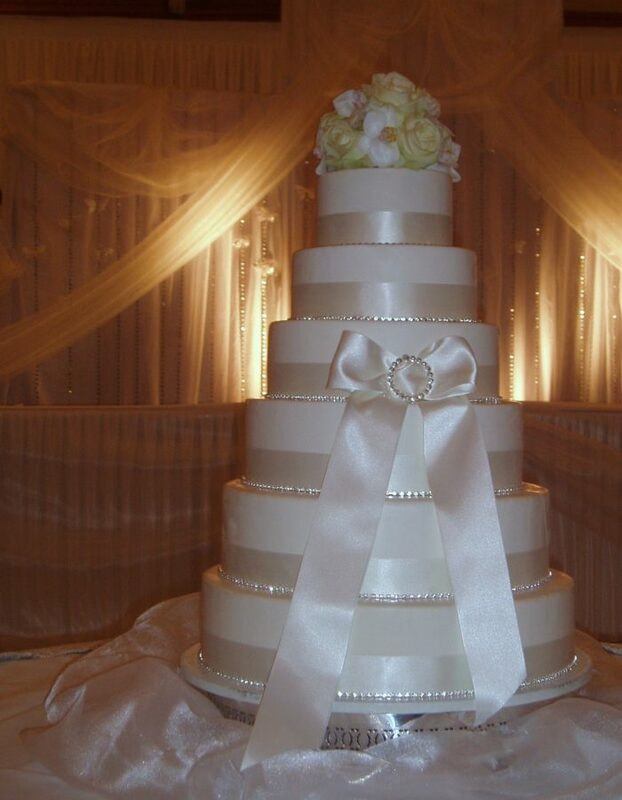 Do contact me to discuss your ideas.